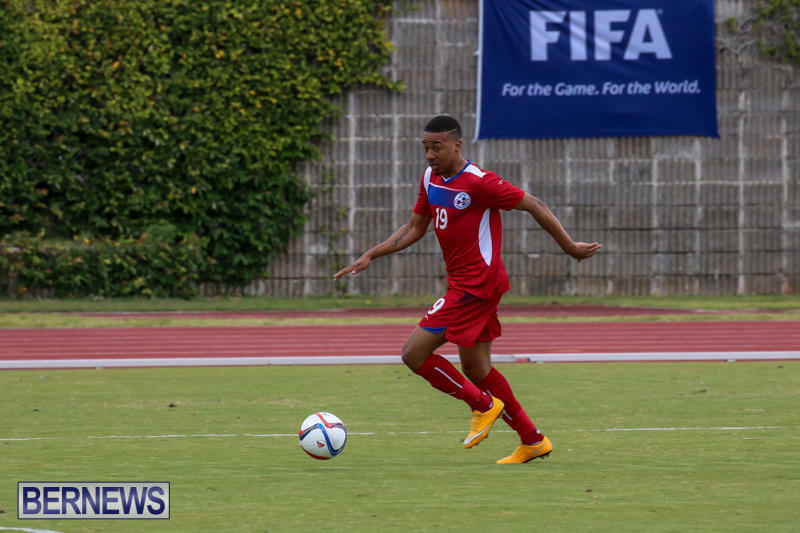 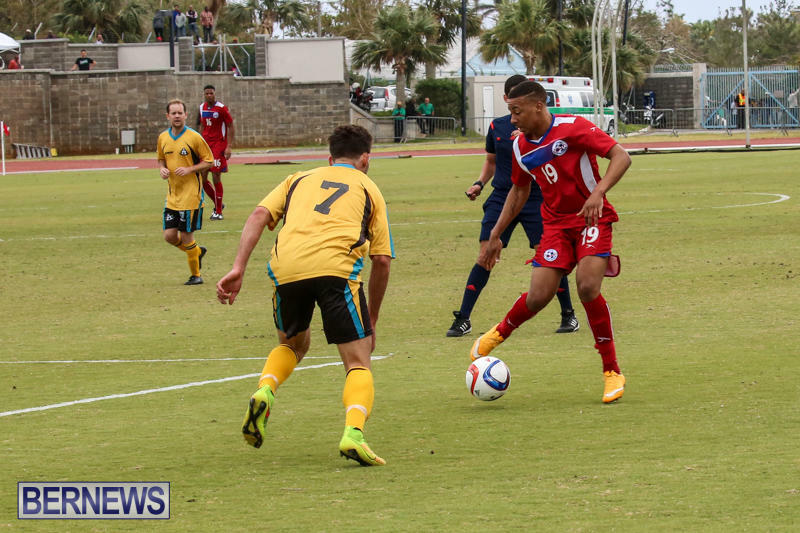 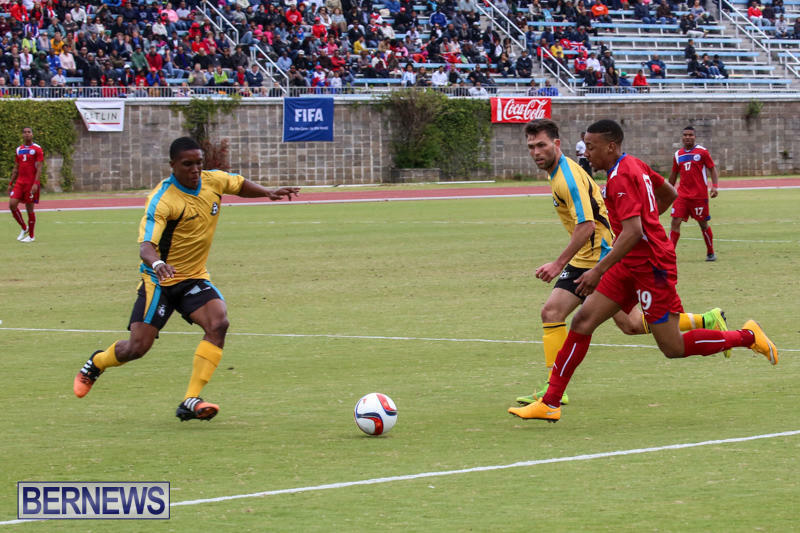 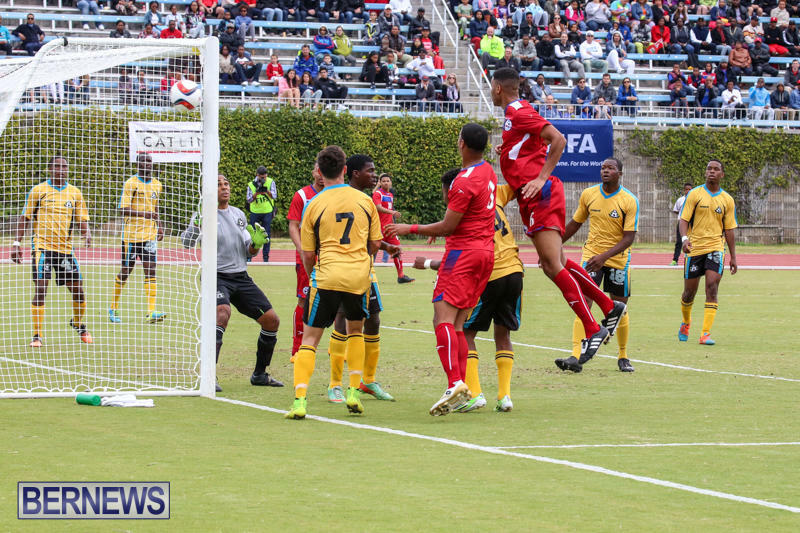 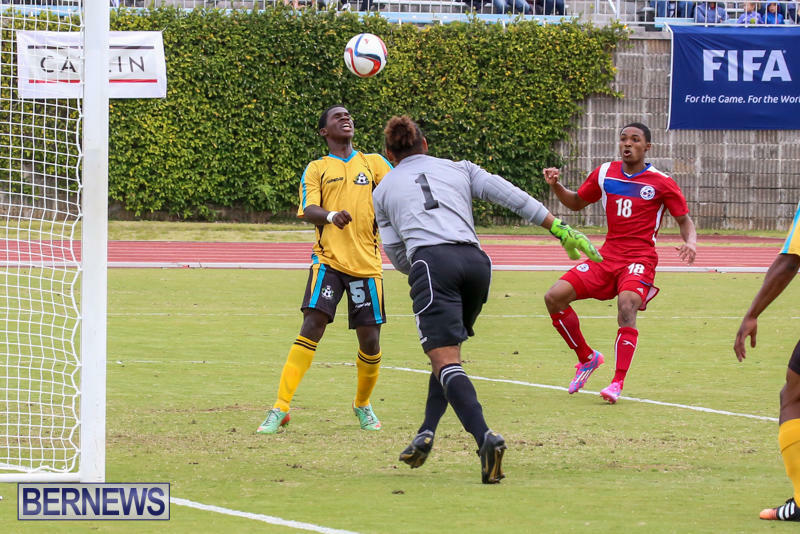 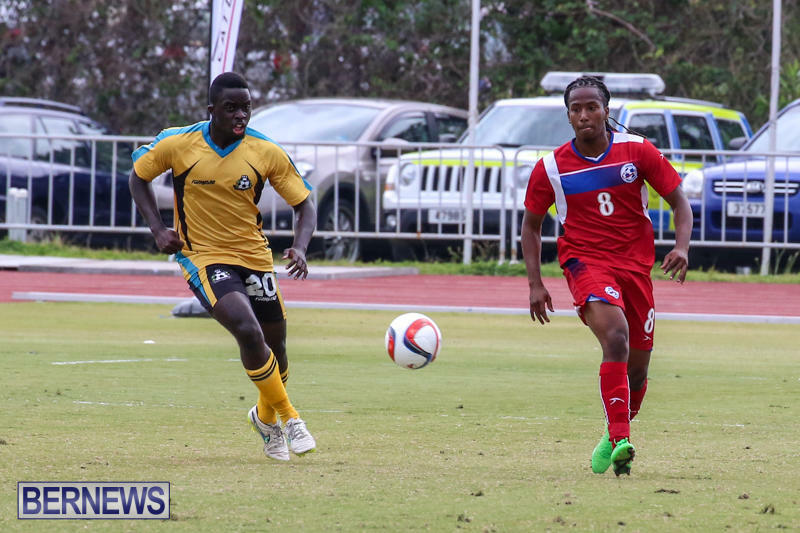 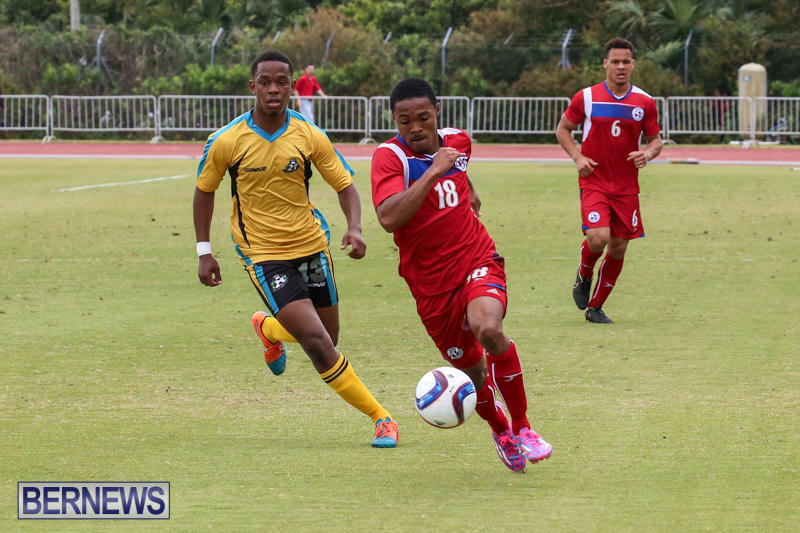 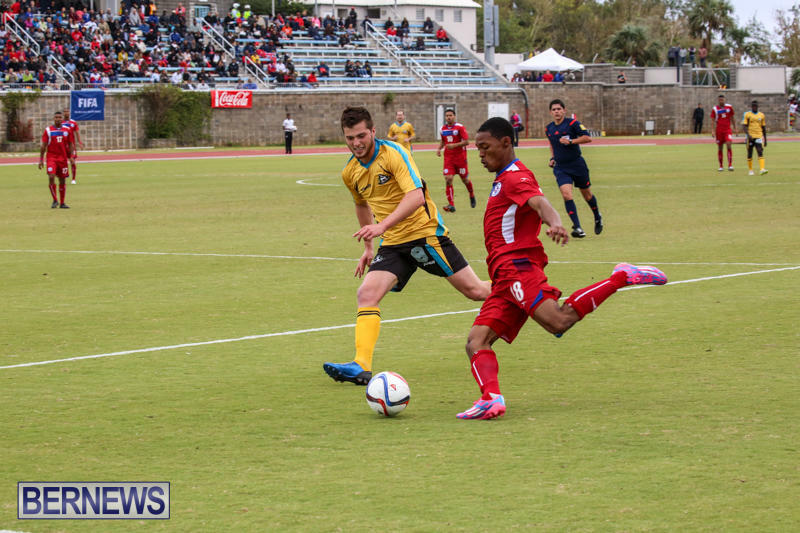 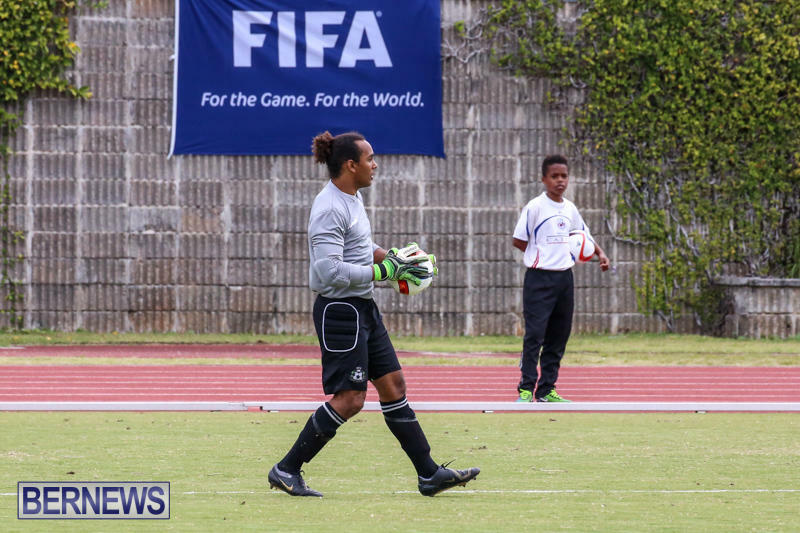 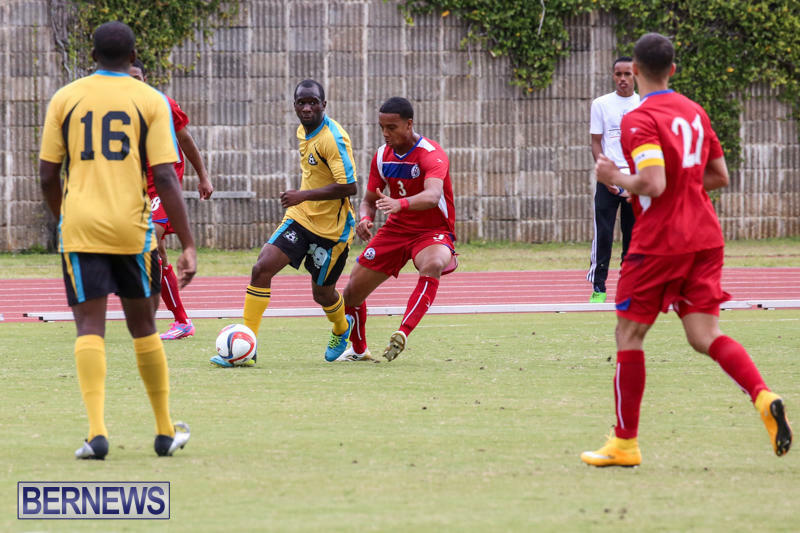 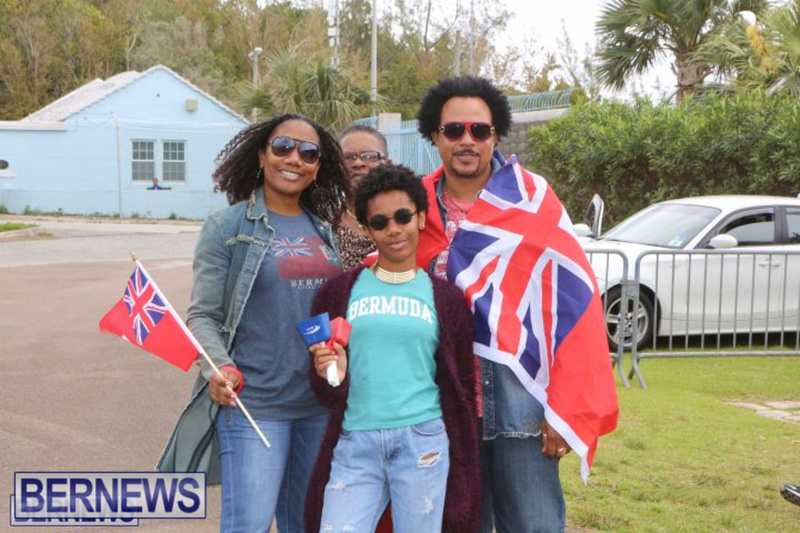 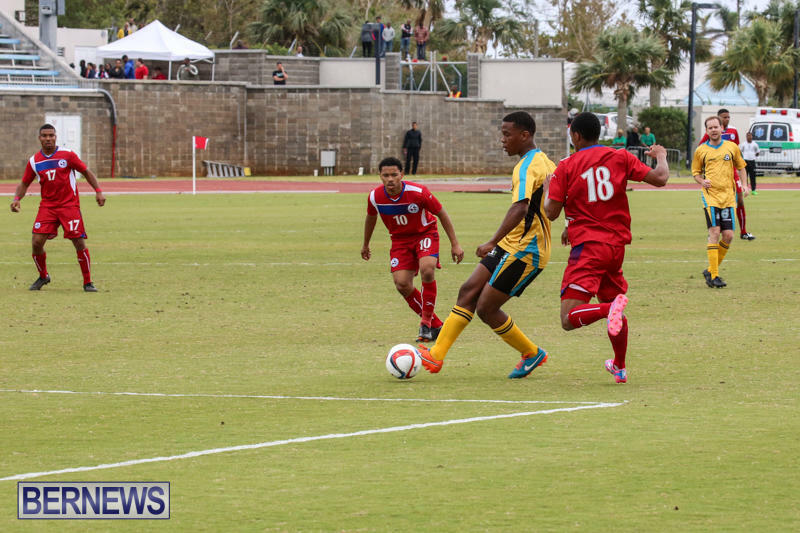 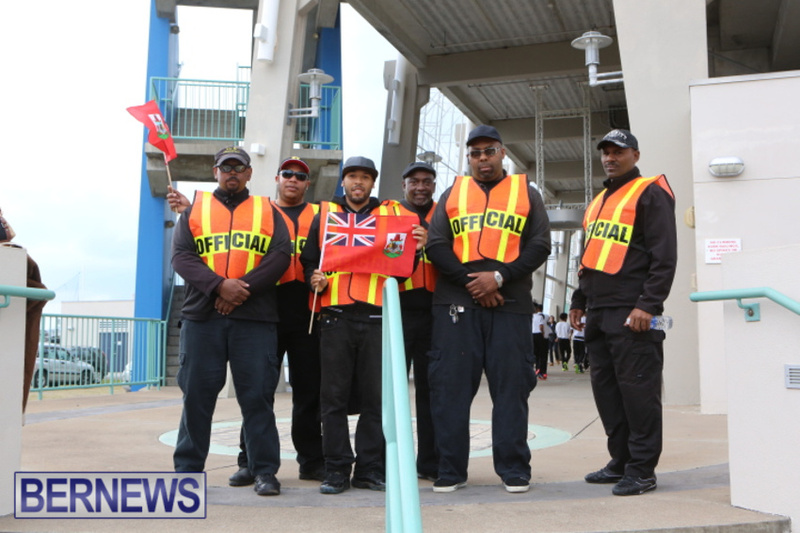 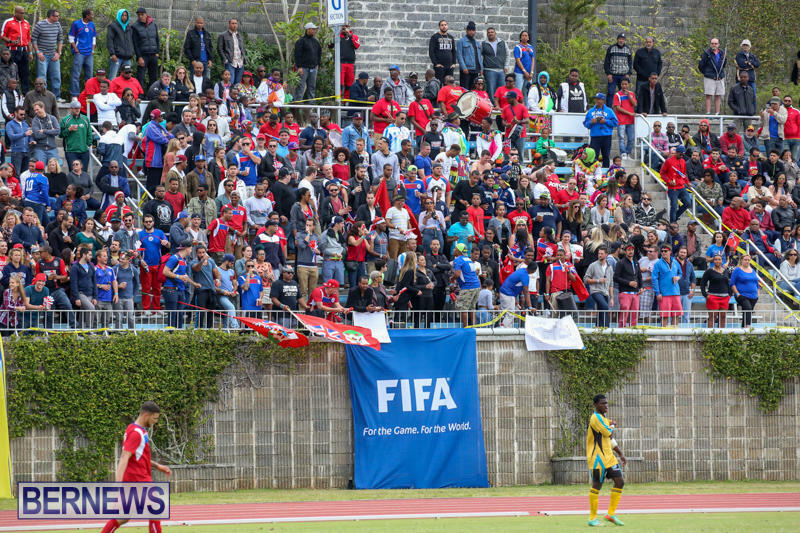 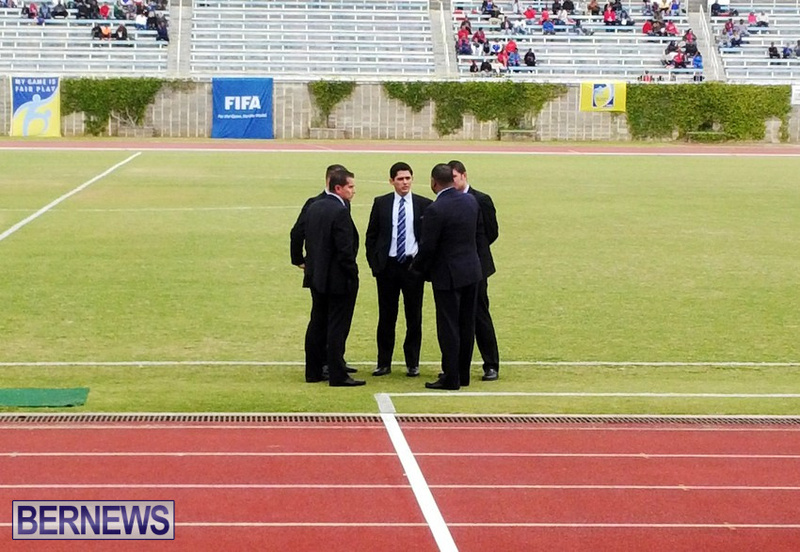 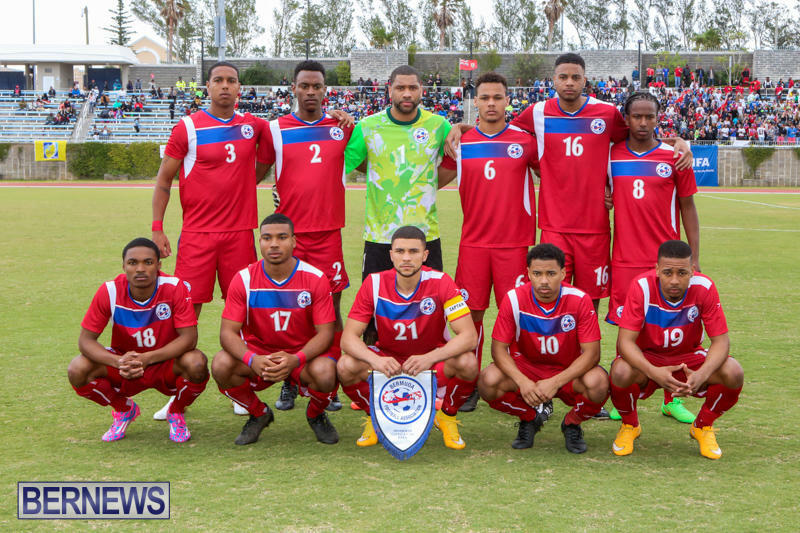 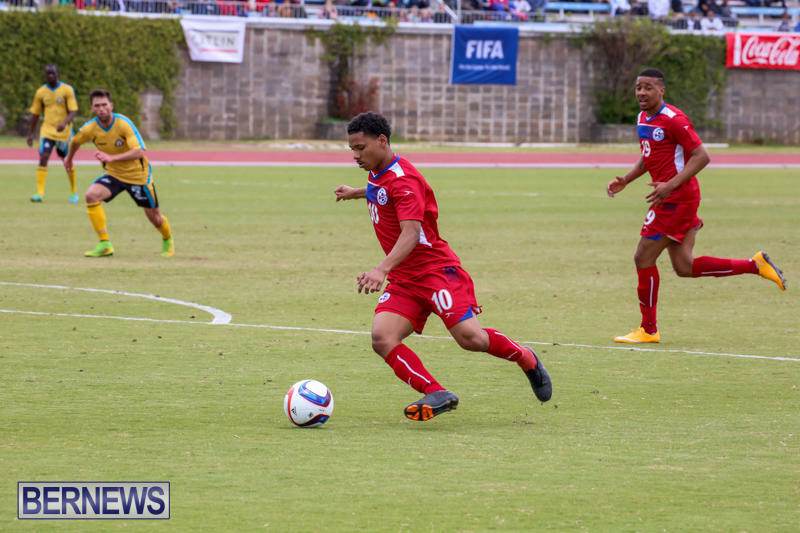 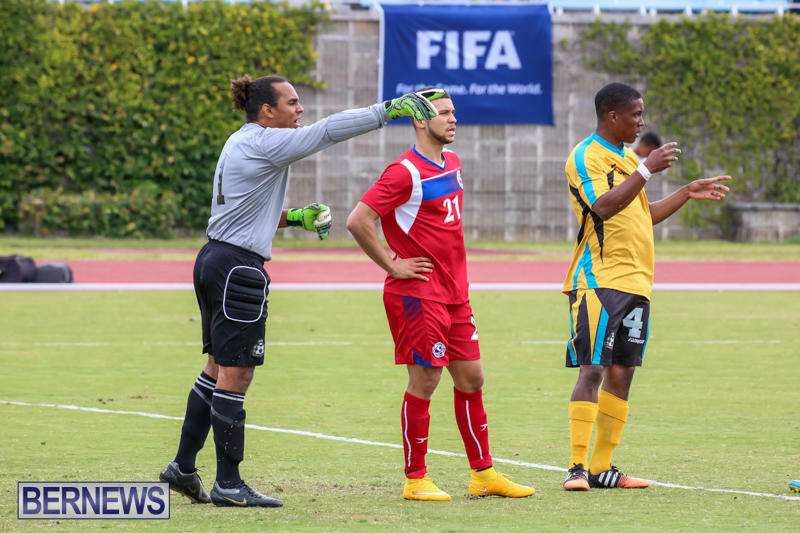 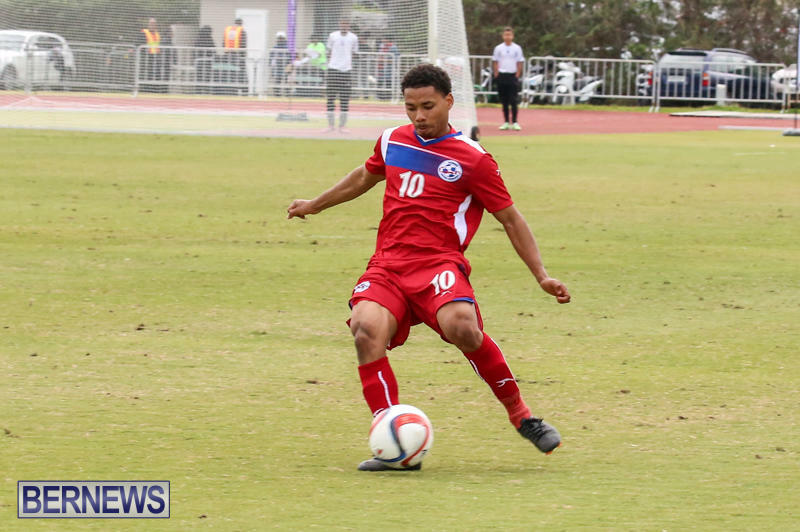 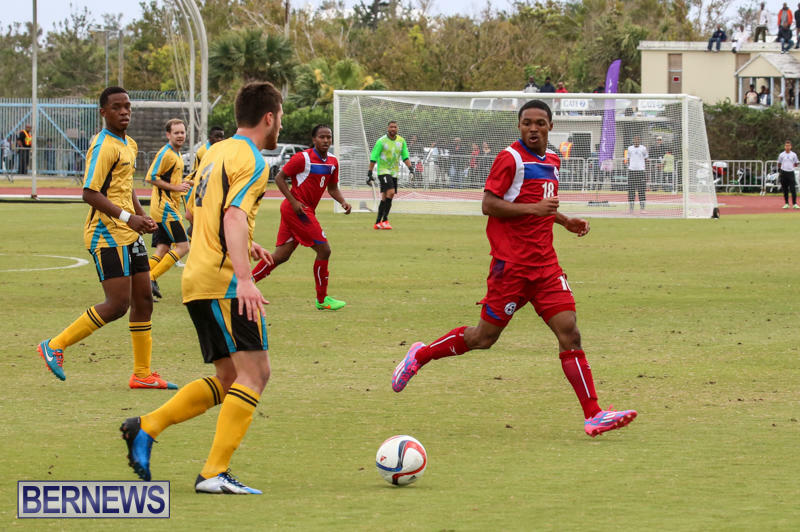 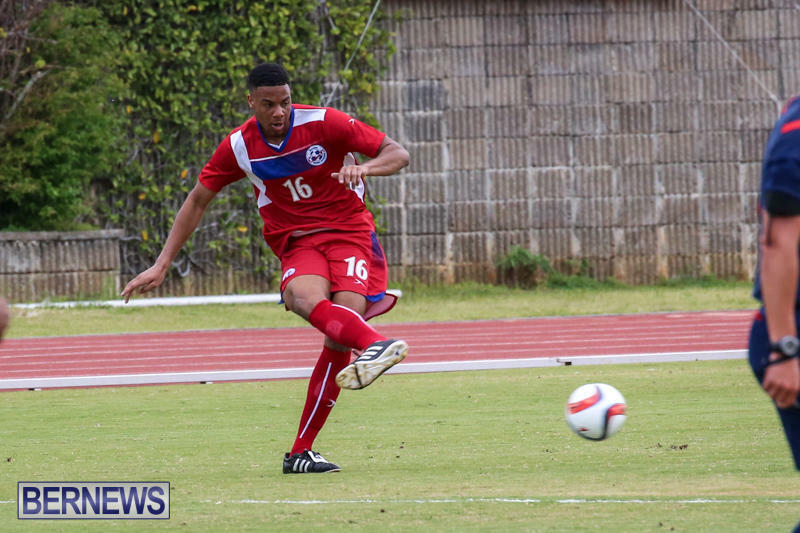 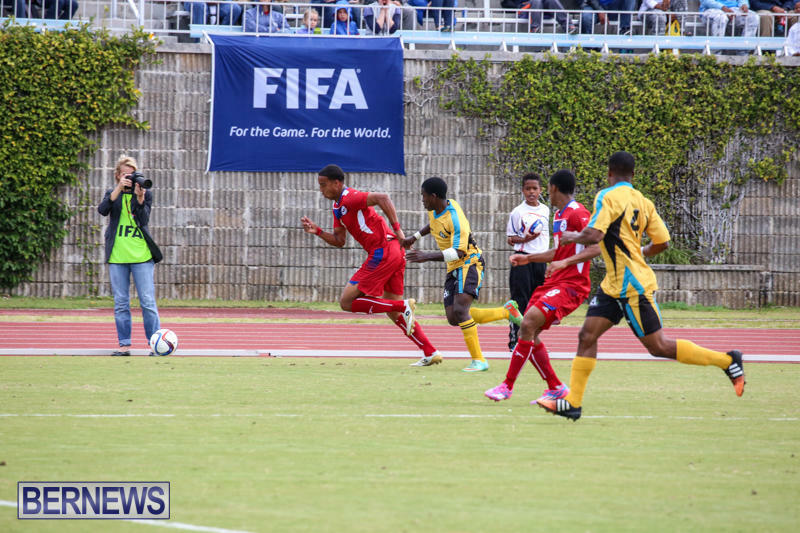 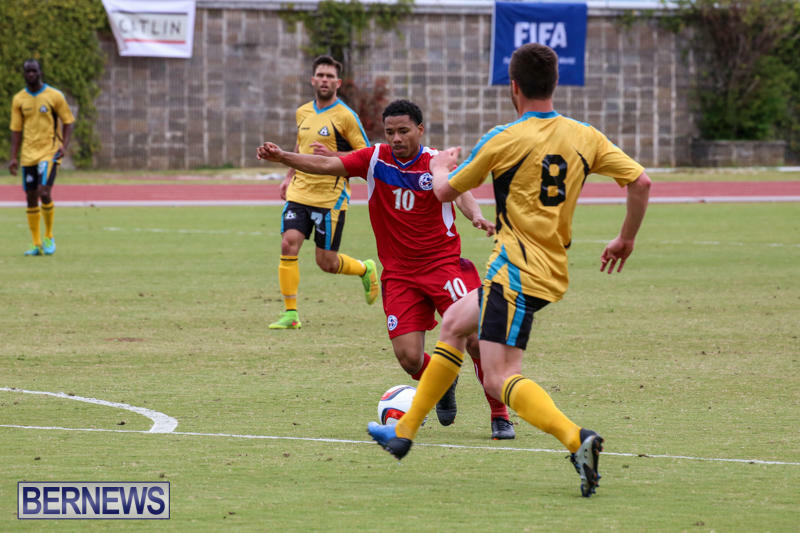 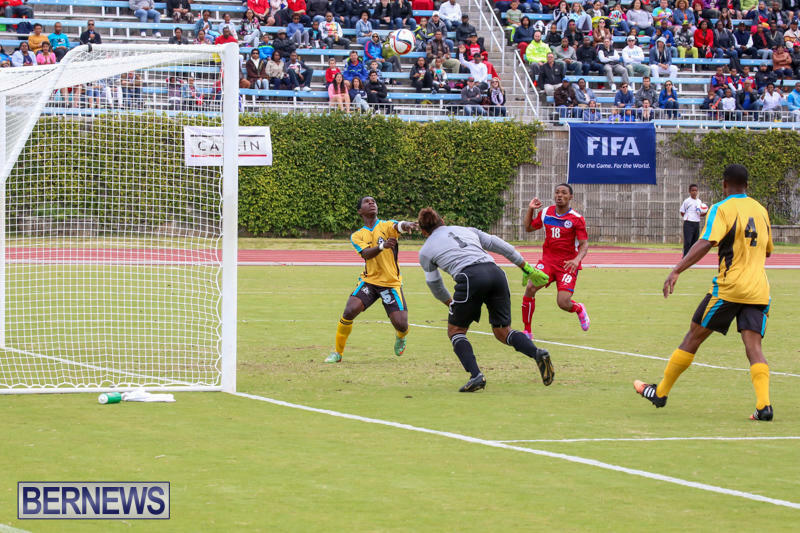 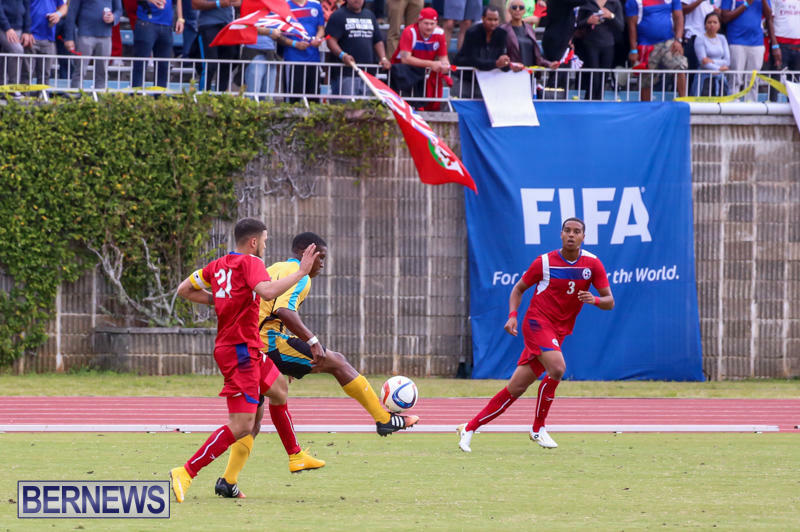 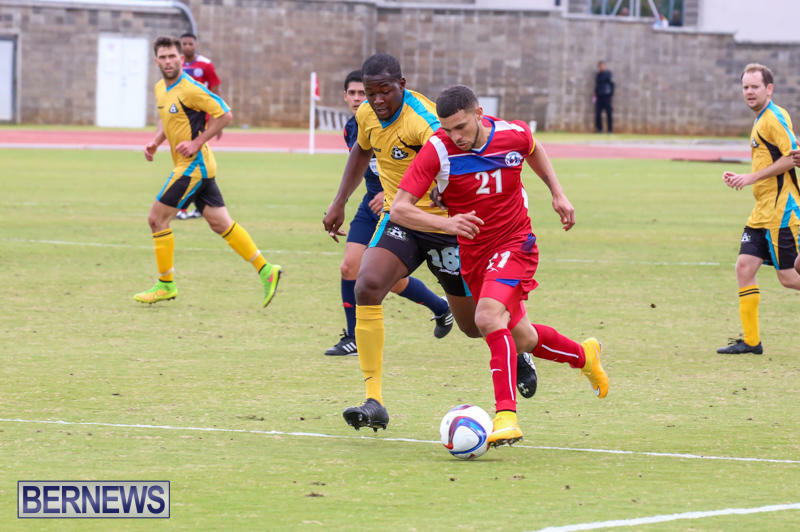 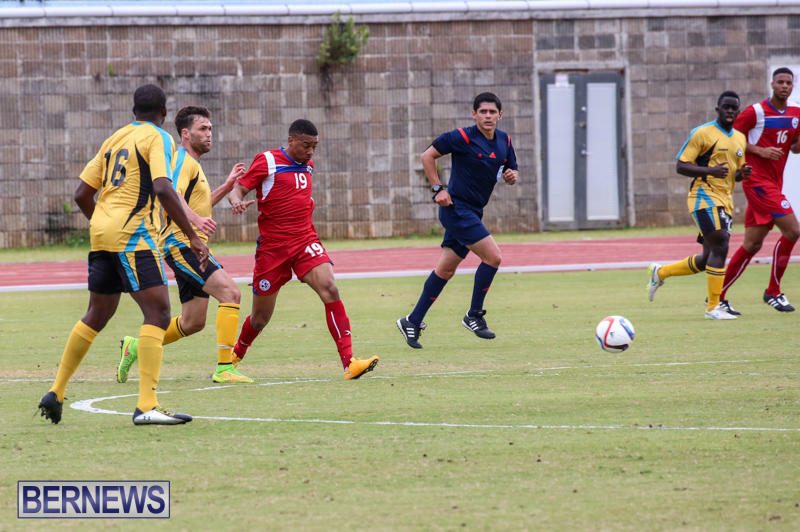 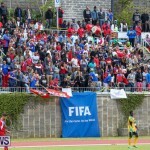 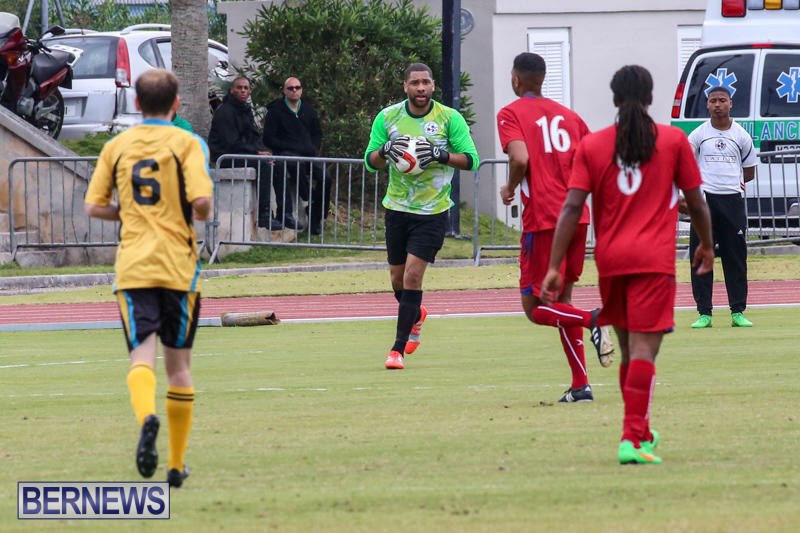 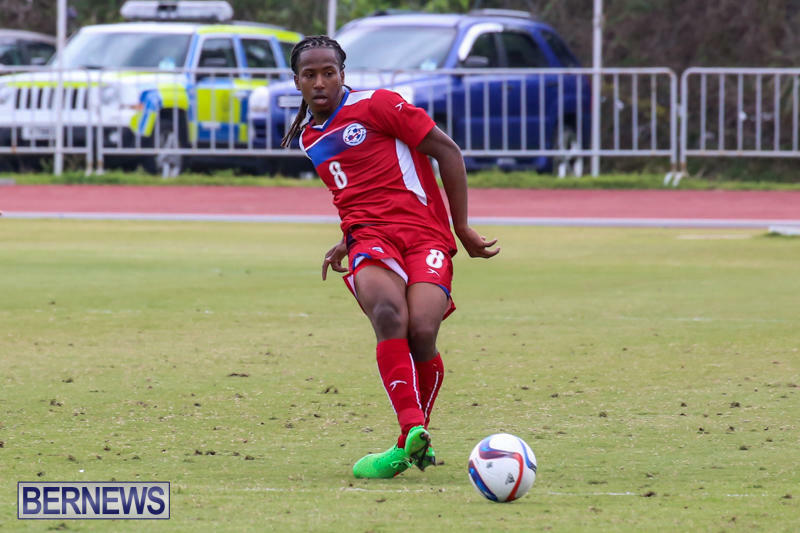 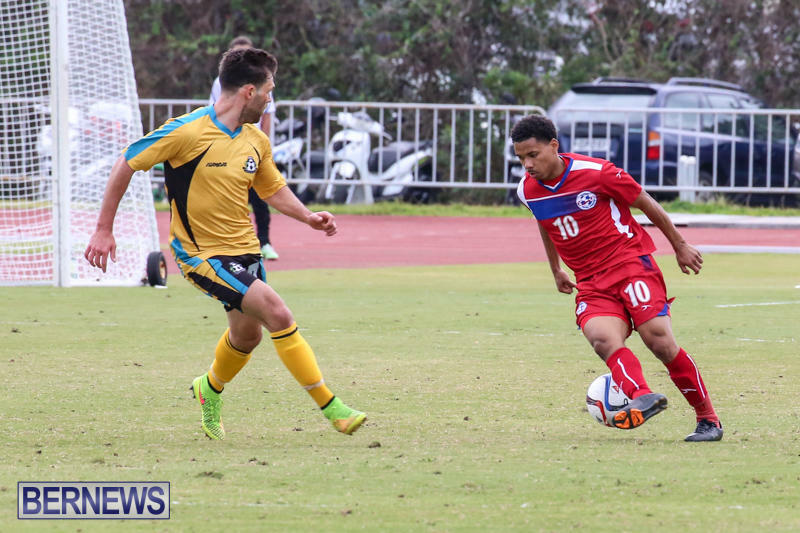 [Updated] The Bermuda national football team continued their 2018 FIFA World Cup Russia qualifying campaign today [Mar 29] as they clashed in a rematch against the Bahamas, with kick off taking place at 3.00pm in front of a sold out crowd. 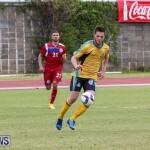 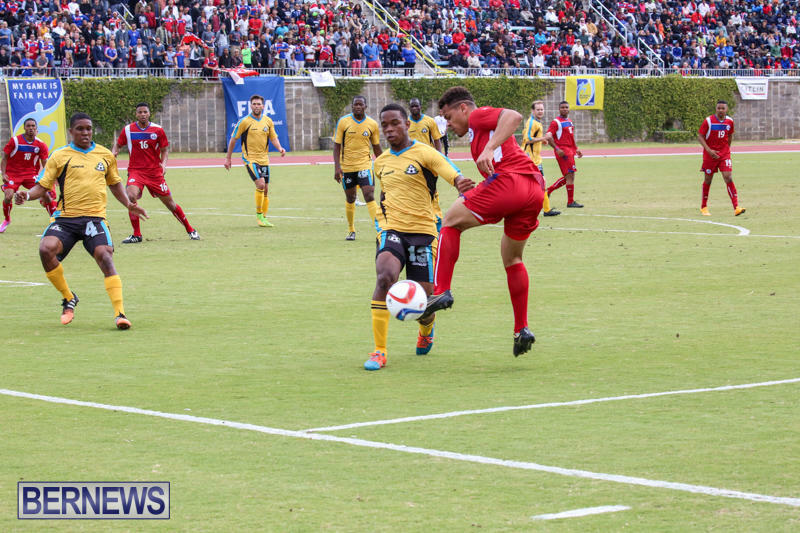 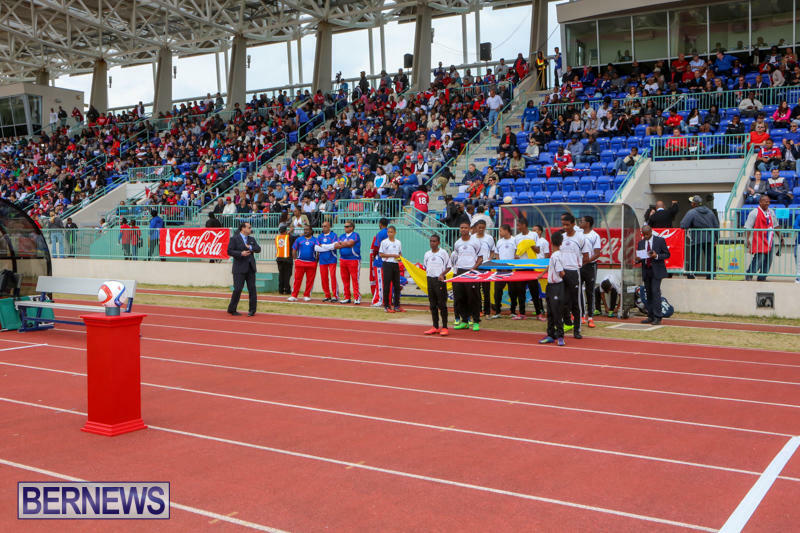 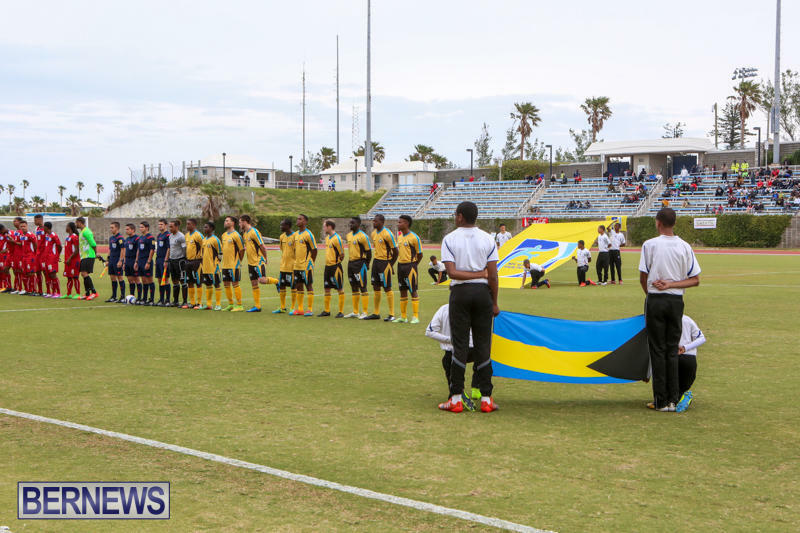 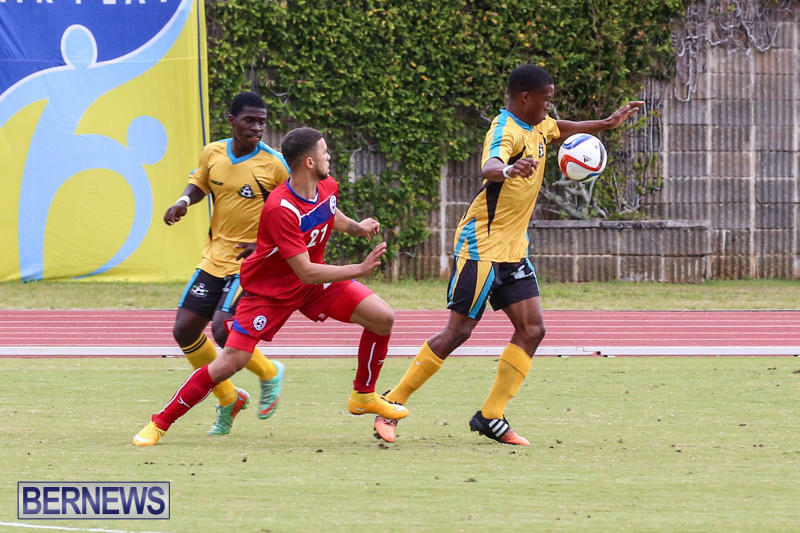 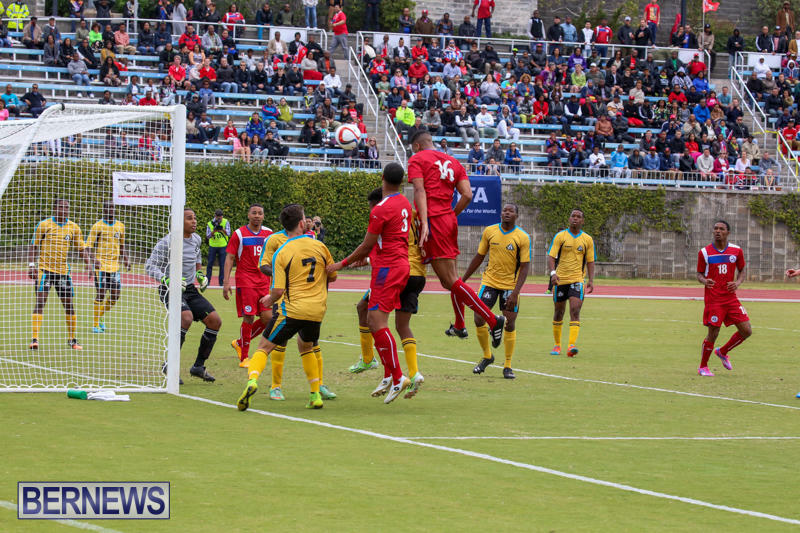 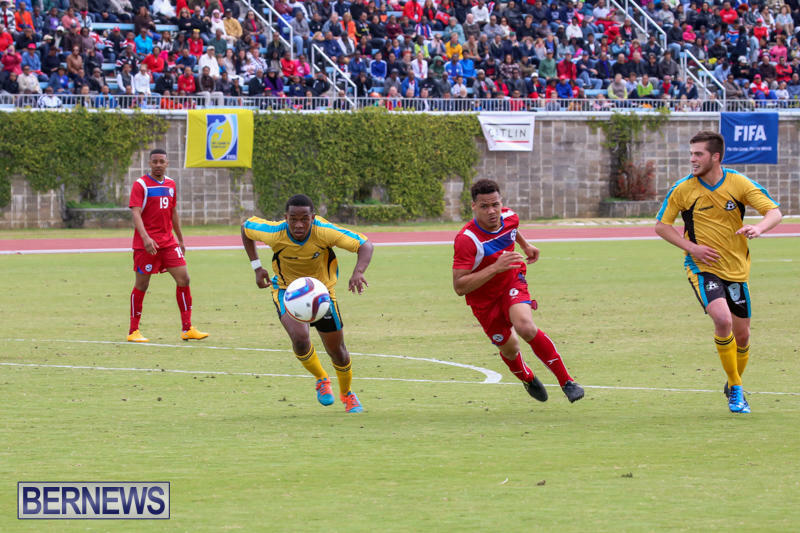 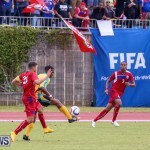 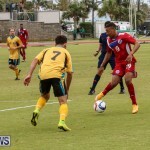 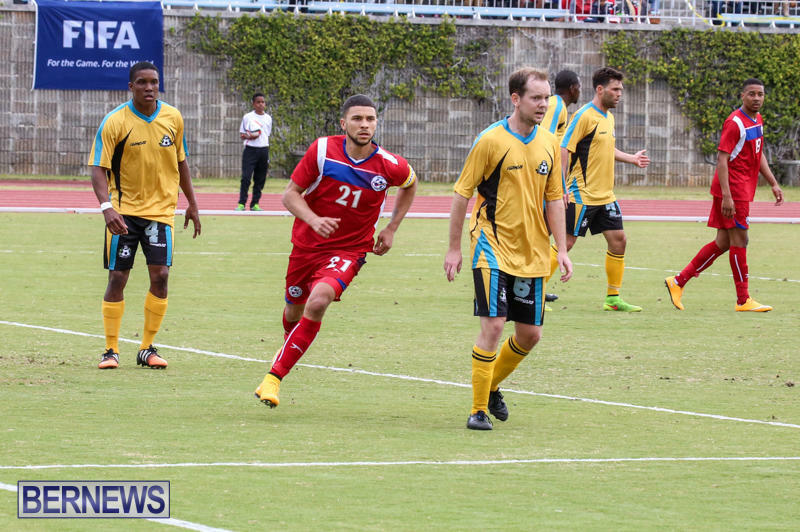 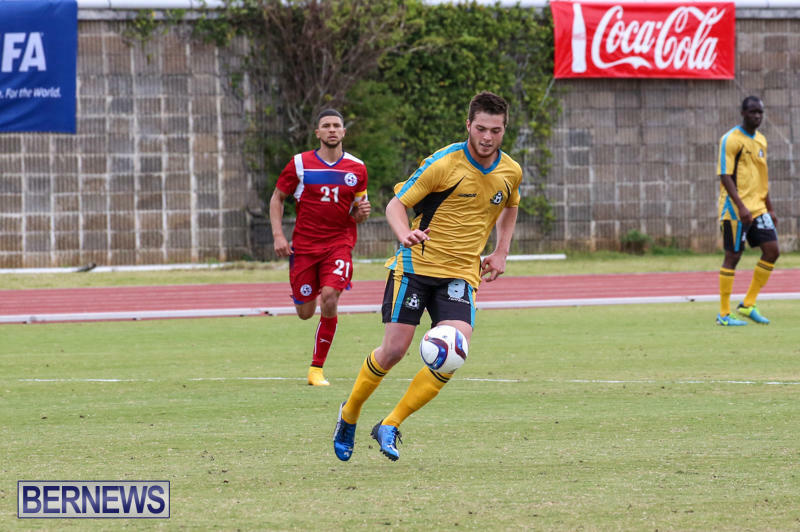 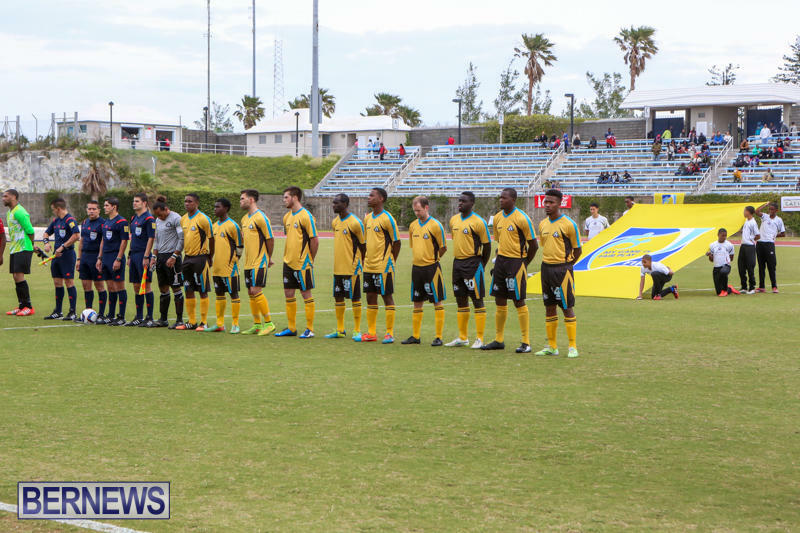 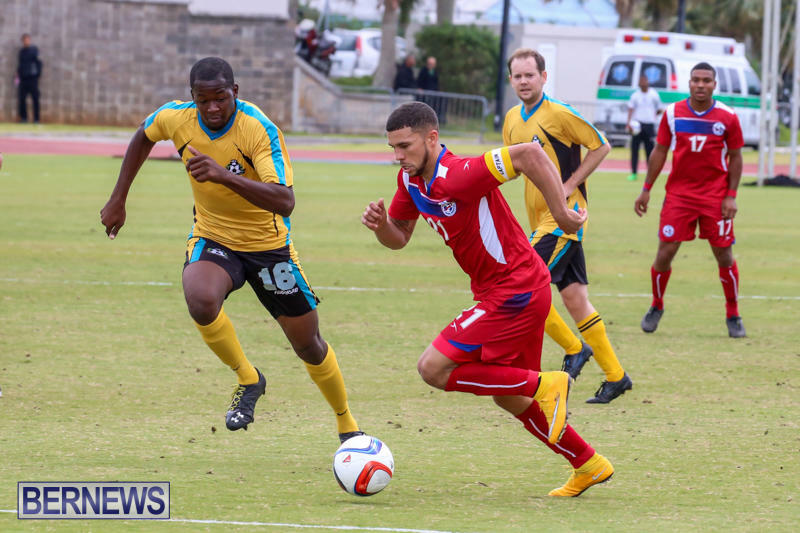 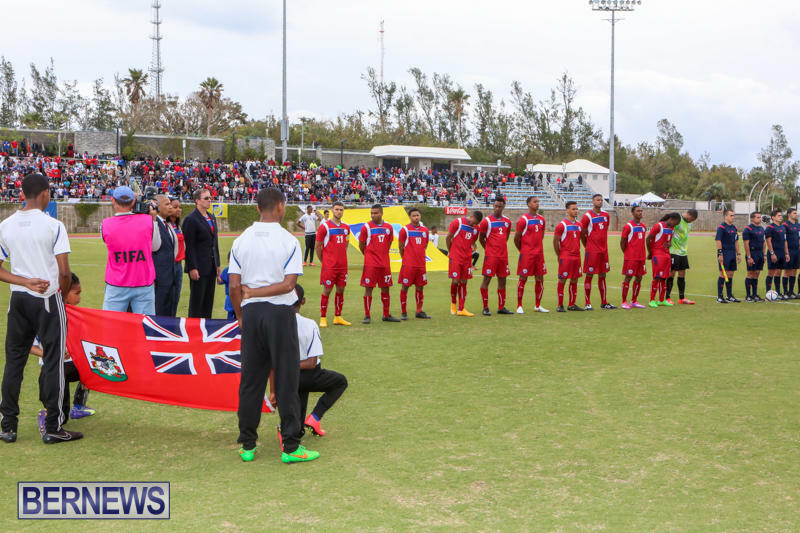 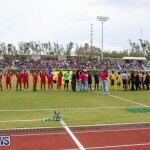 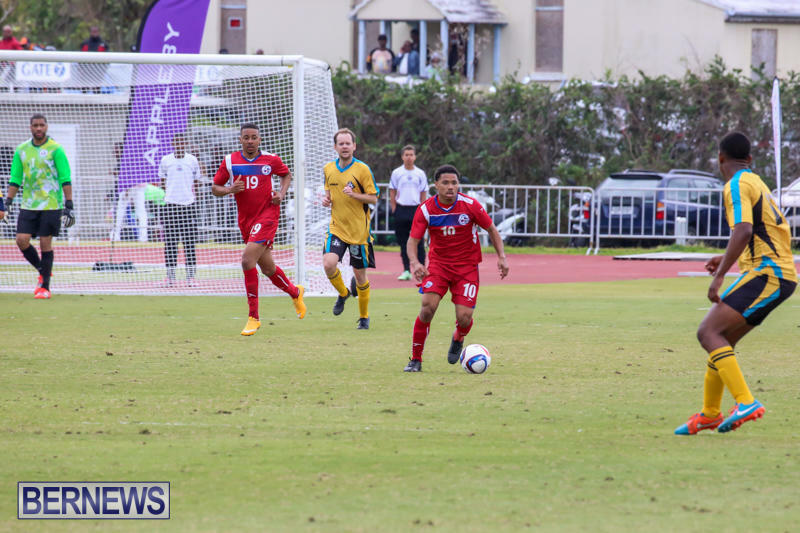 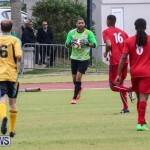 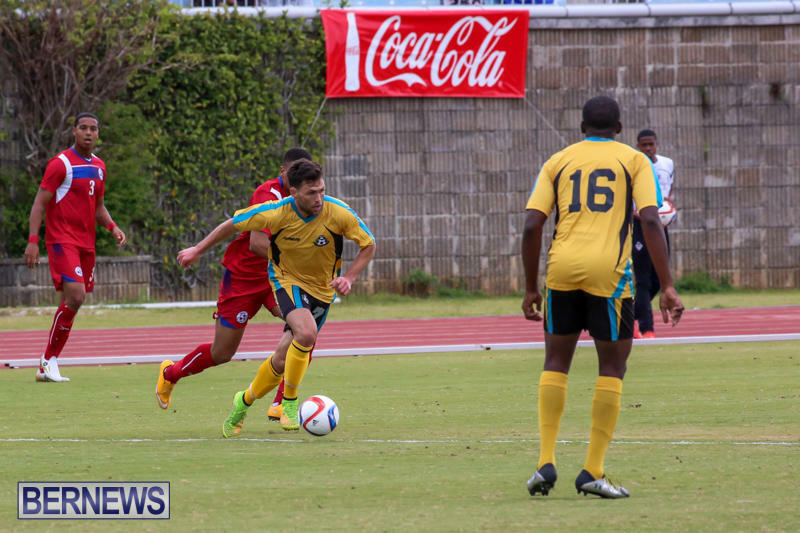 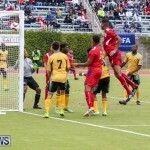 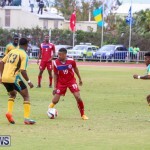 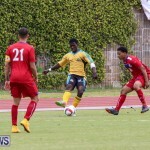 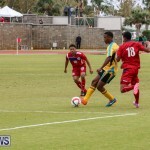 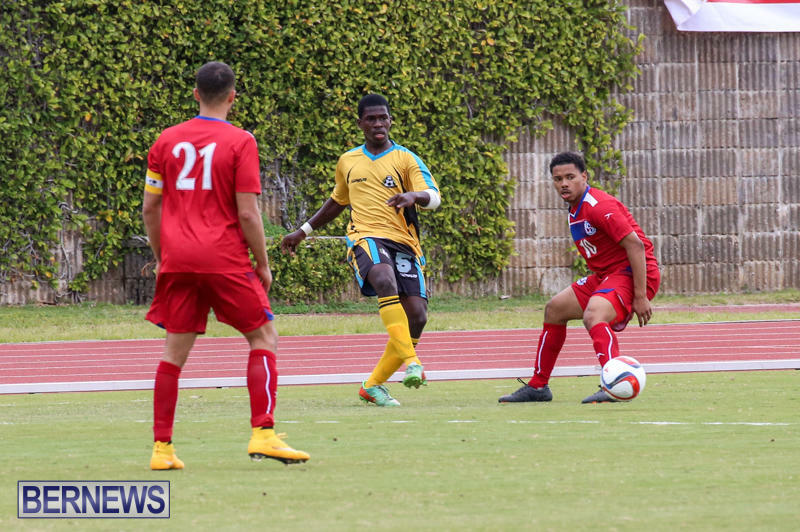 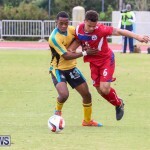 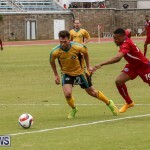 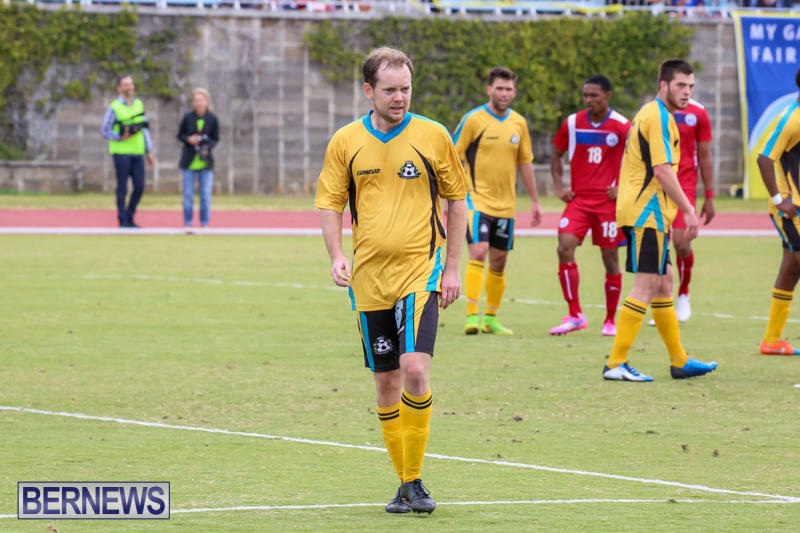 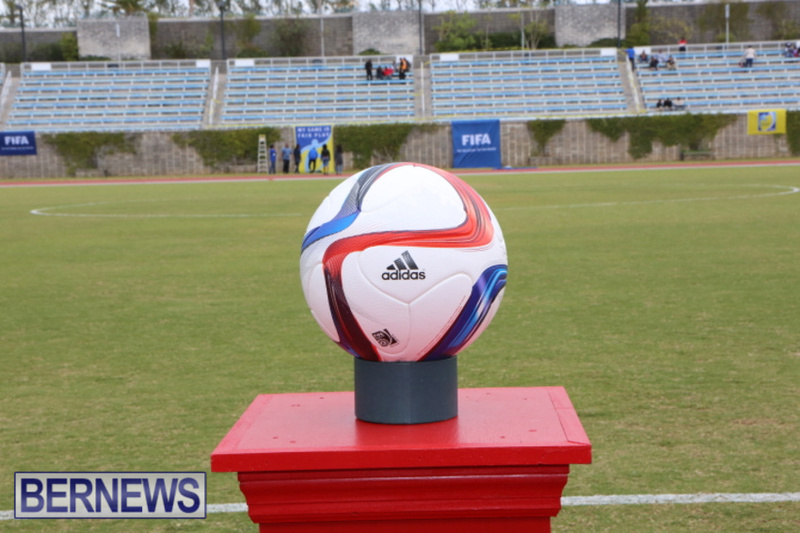 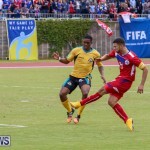 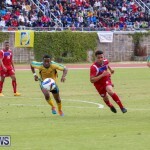 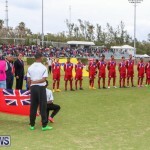 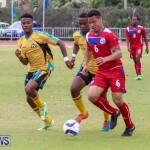 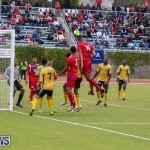 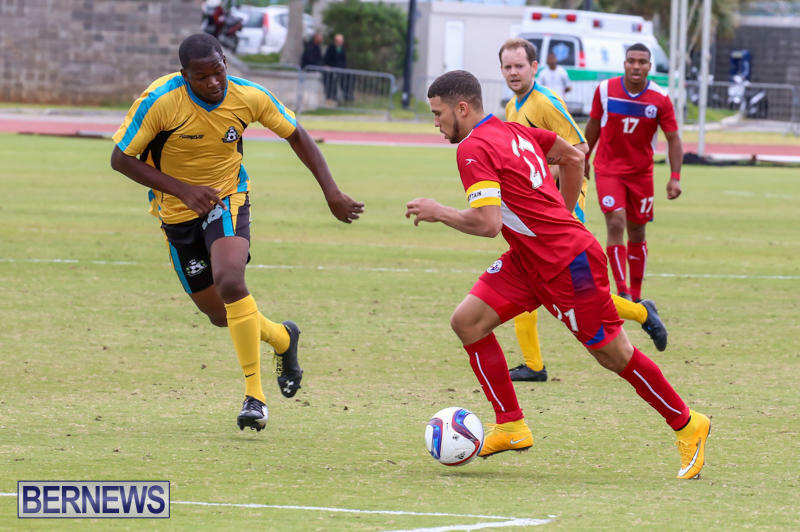 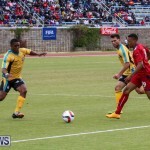 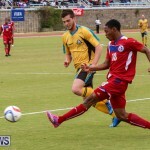 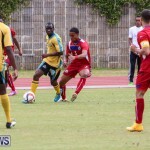 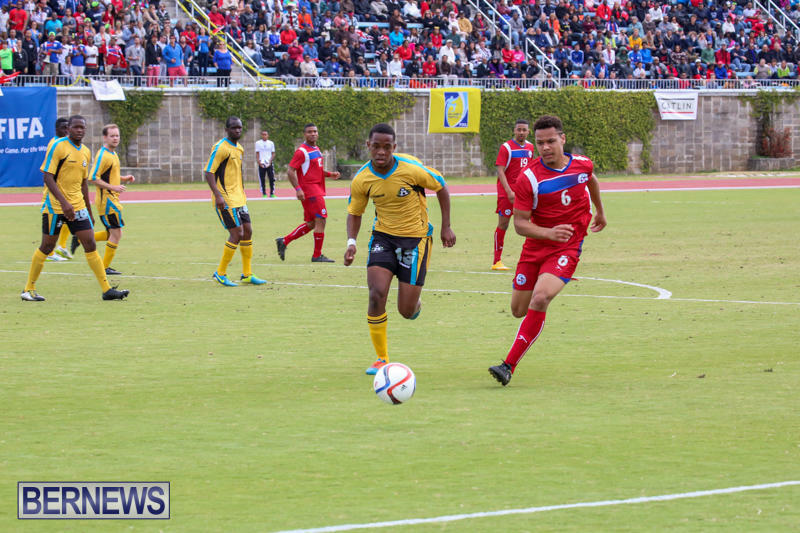 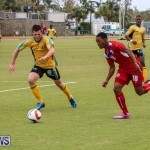 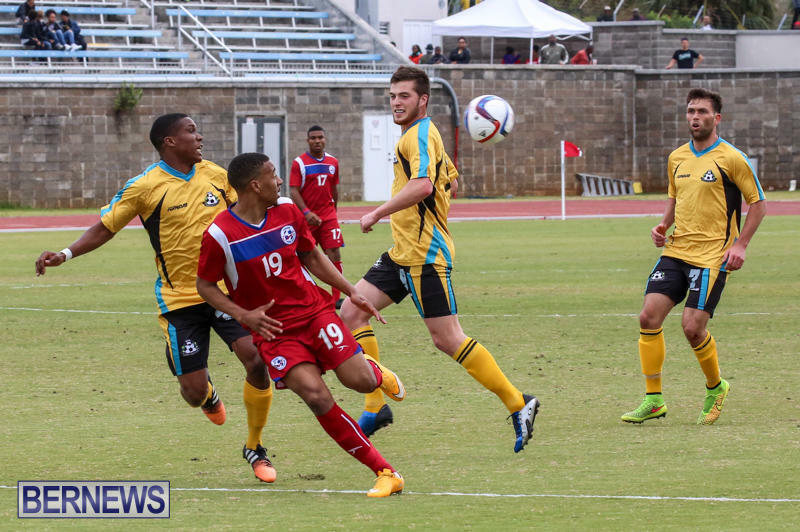 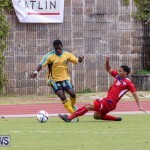 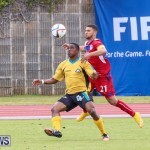 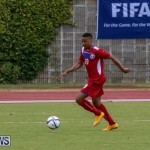 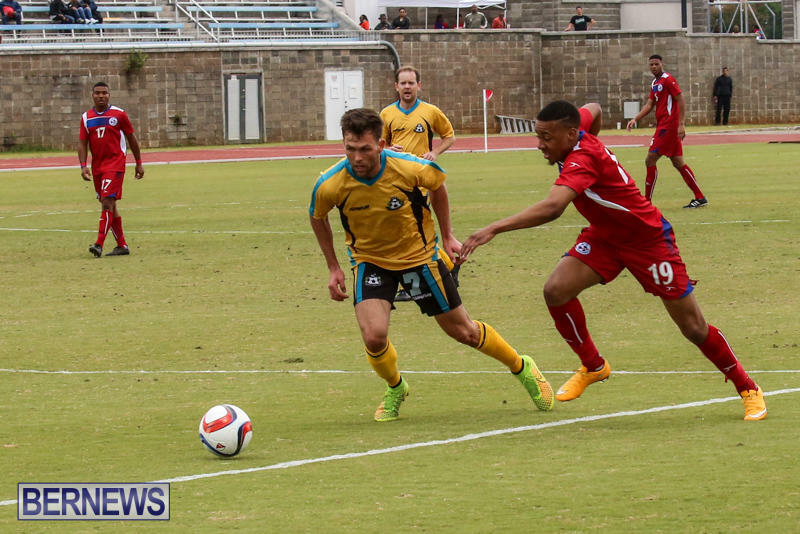 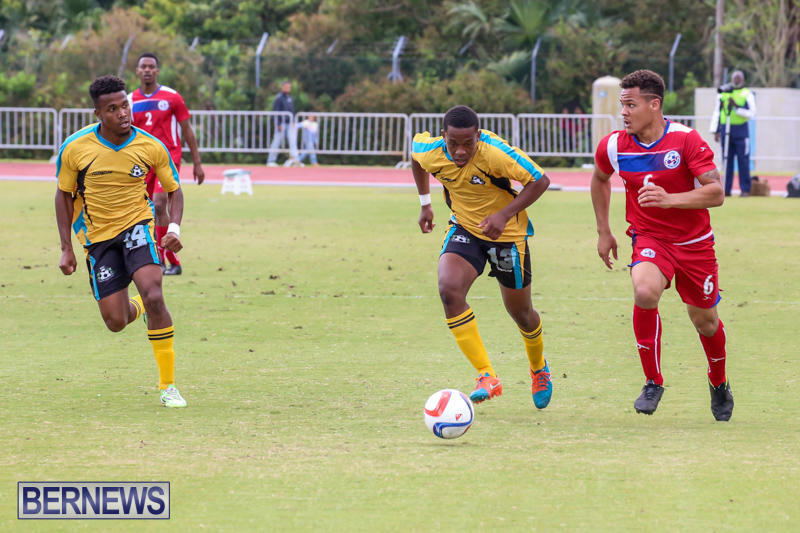 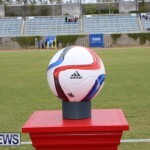 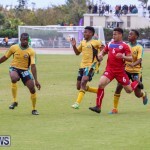 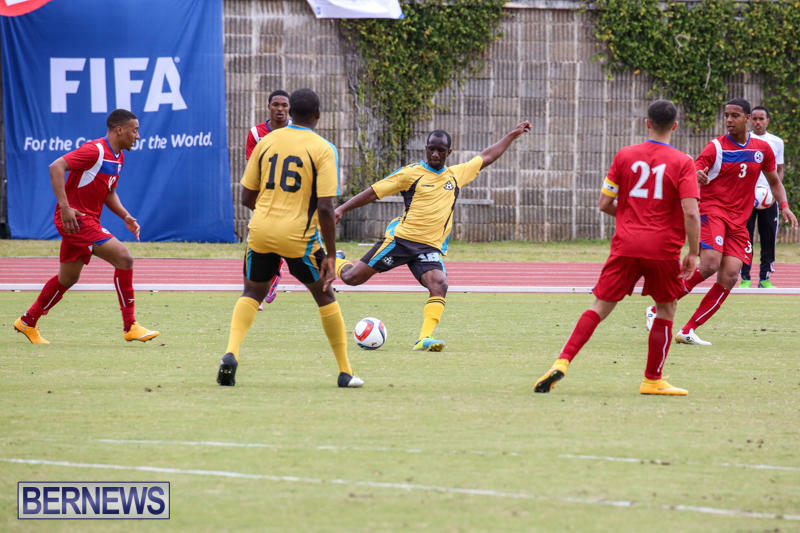 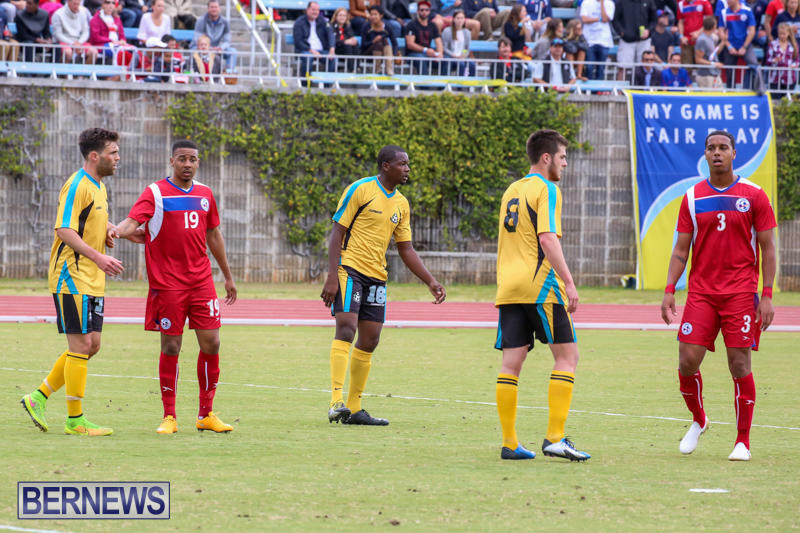 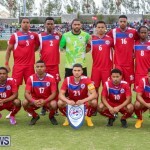 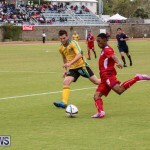 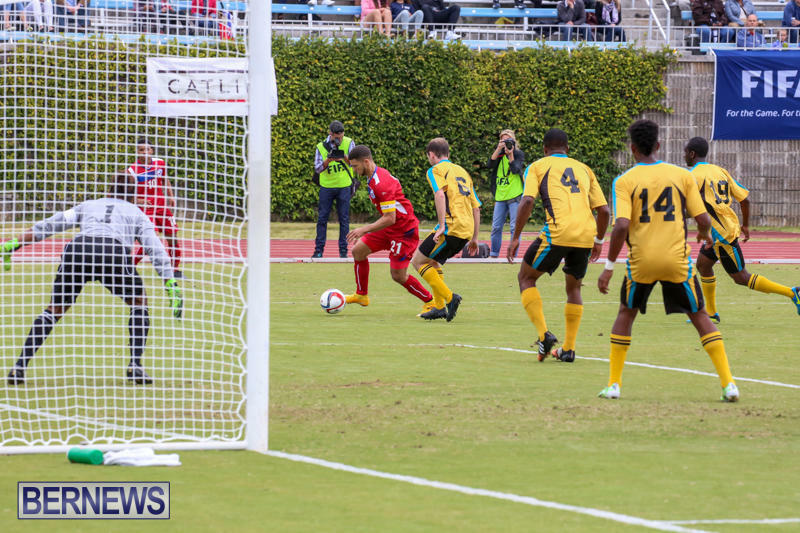 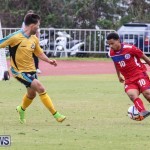 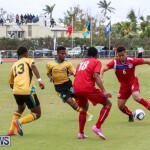 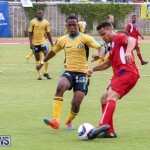 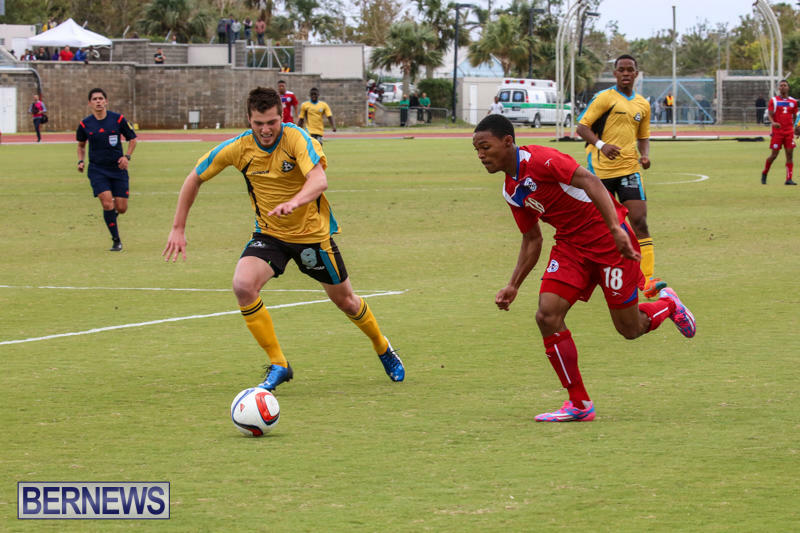 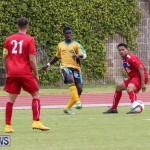 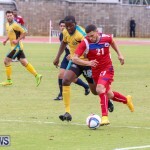 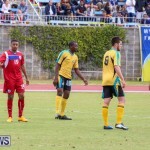 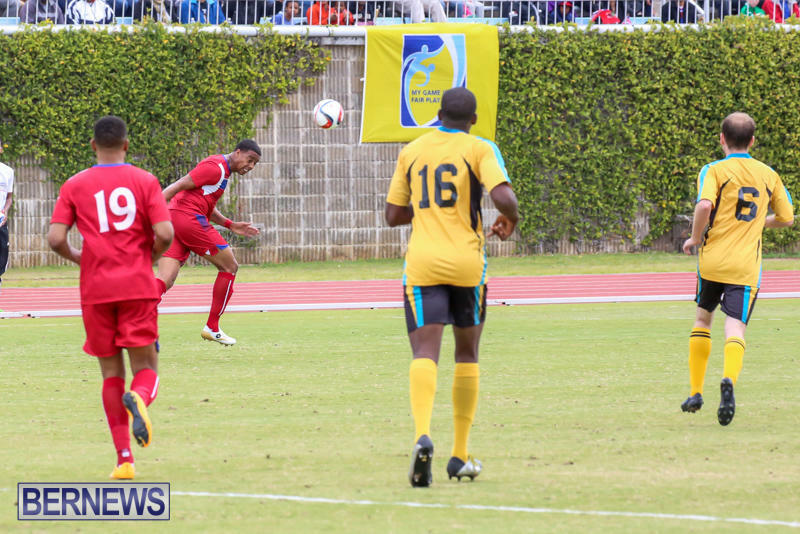 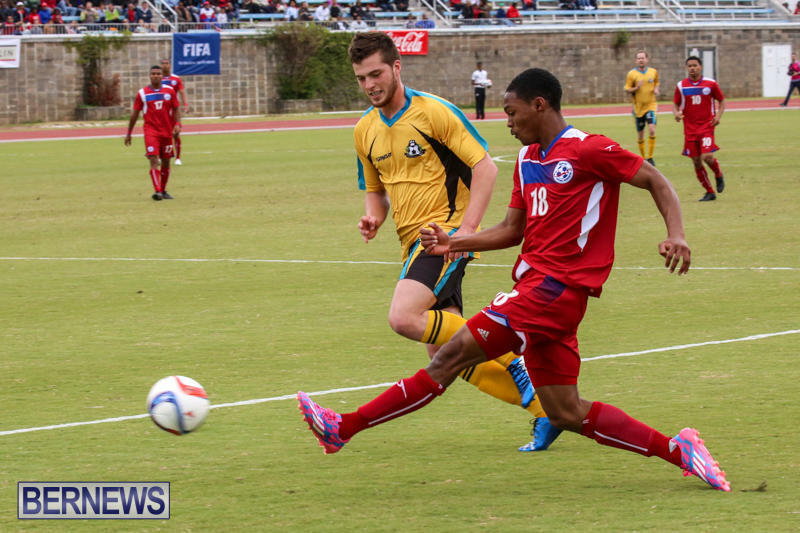 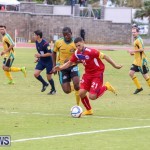 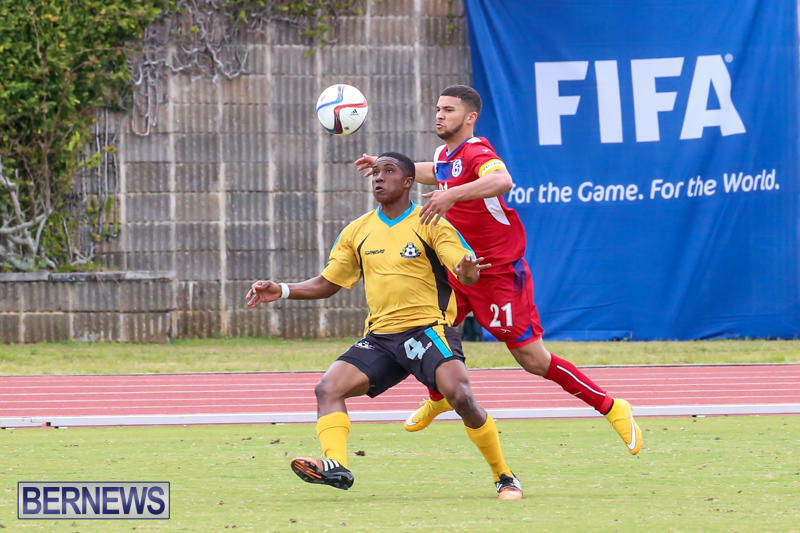 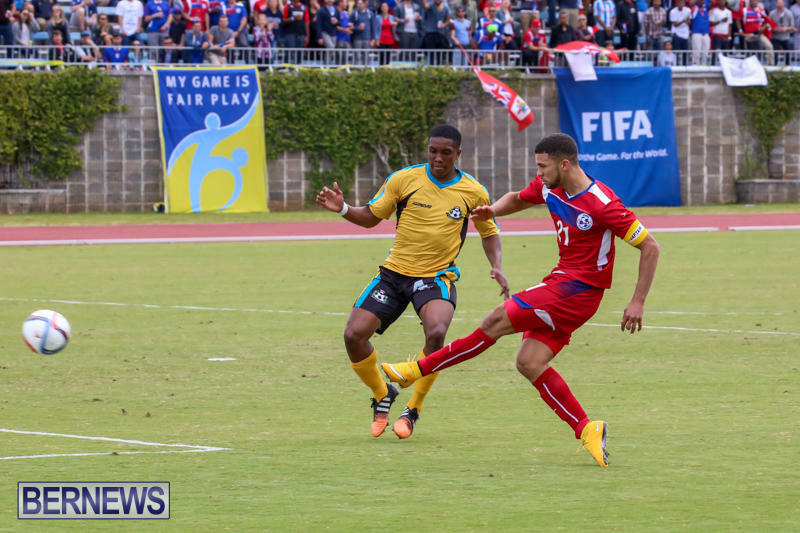 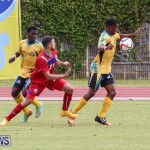 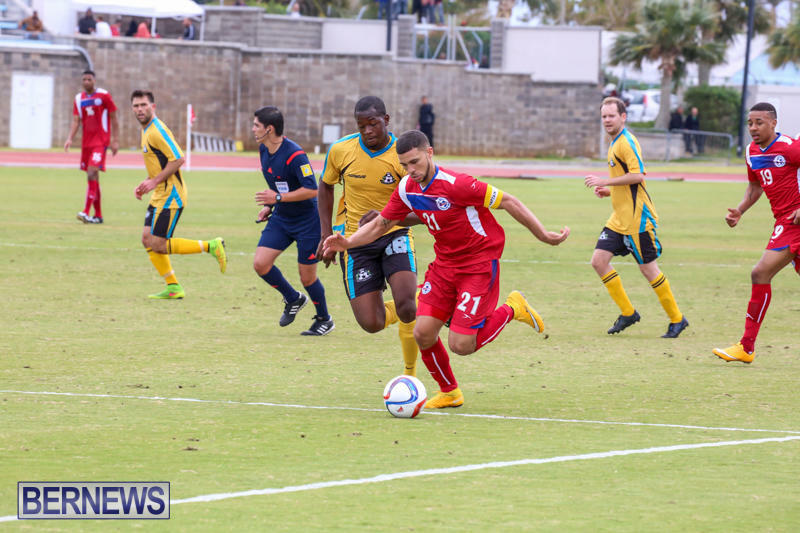 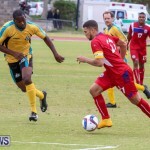 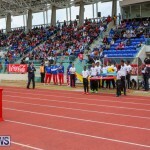 This match marks the second time the two teams have battled, following Bermuda’s 5-0 defeat of the Bahamas on March 25th, which saw goals from Dante Leverock, Nahki Wells, Zeiko Lewis and two from Justin Donawa. 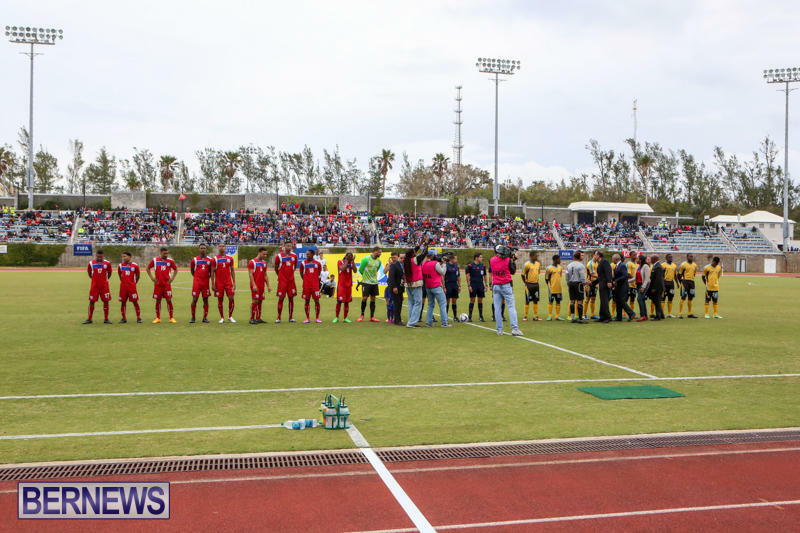 Bermuda’s starting line-up included Freddy Hall, Jaylon Bather, Tyrrell Burgess, Jaylen Harvey, Drewondae Bascome, Zeiko Lewis, Dante Leverock , Keishen Bean, Justin Donawa, Reggie Lambe, and Nahki Wells. 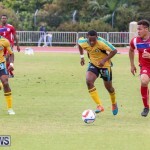 Donawa, who scored two goals last game, was taken off around 30 minutes into the game due to injury, and replaced by Jonte Smith. 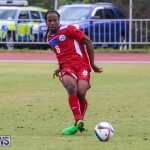 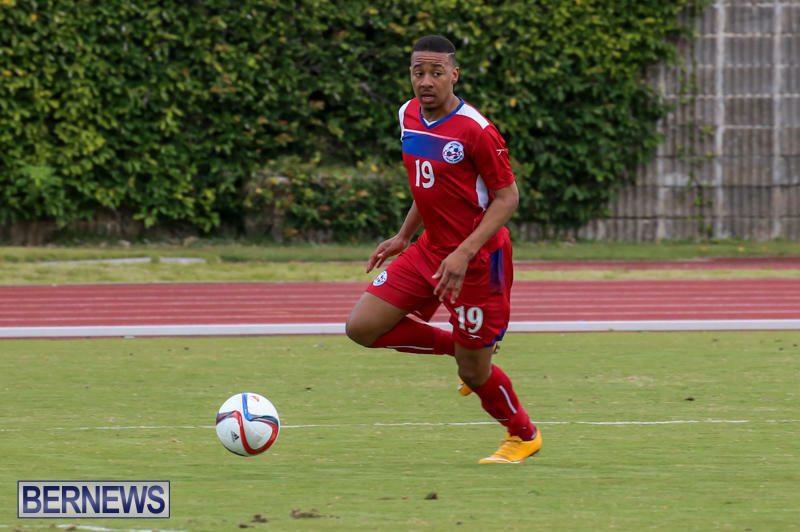 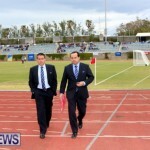 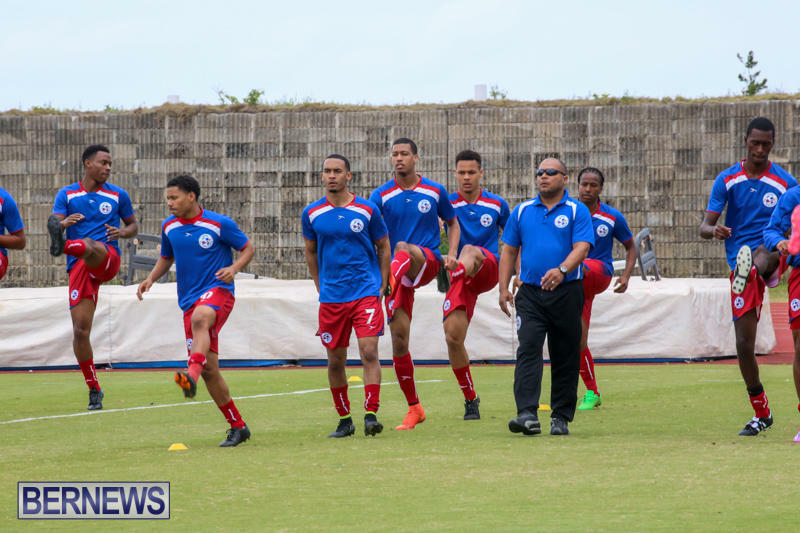 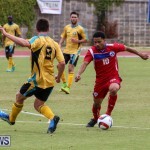 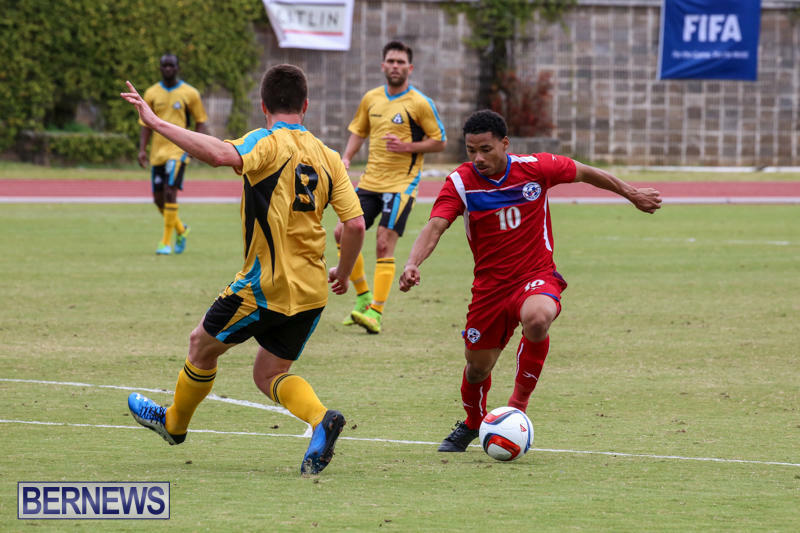 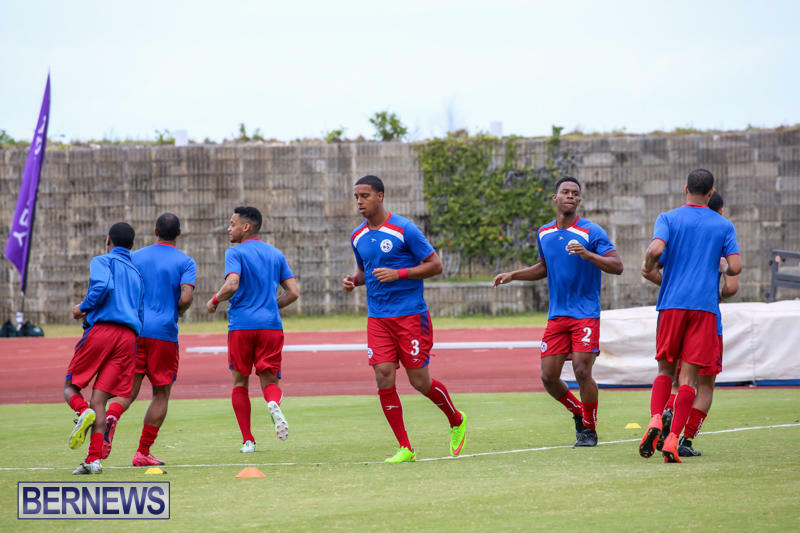 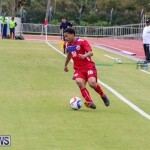 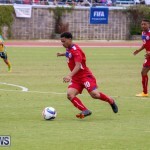 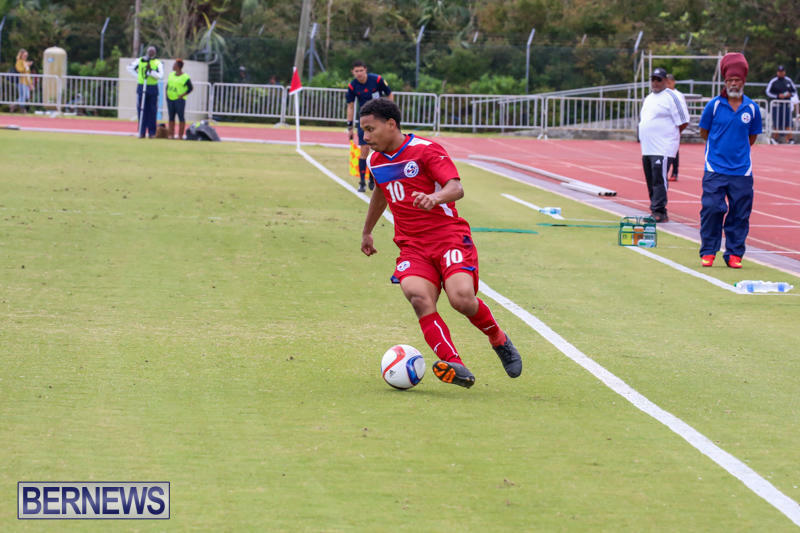 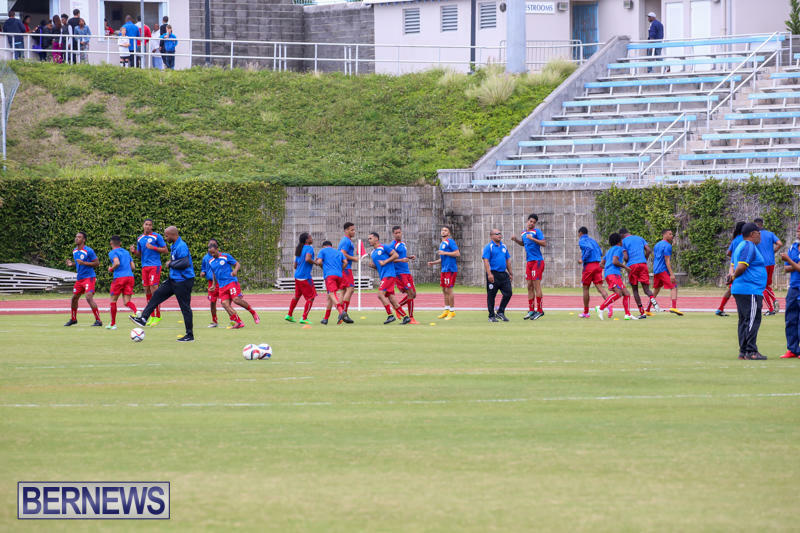 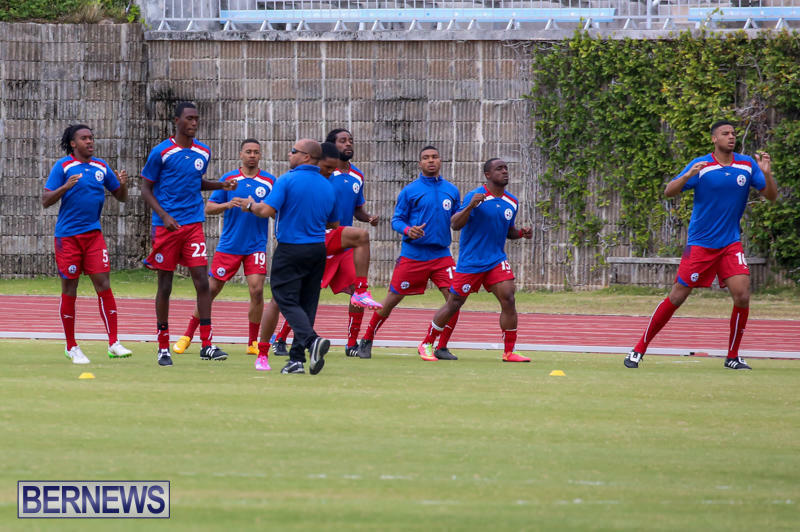 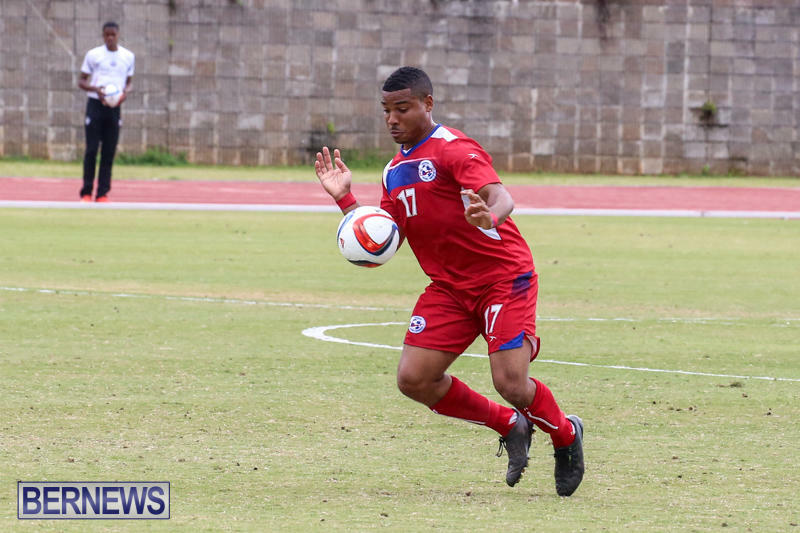 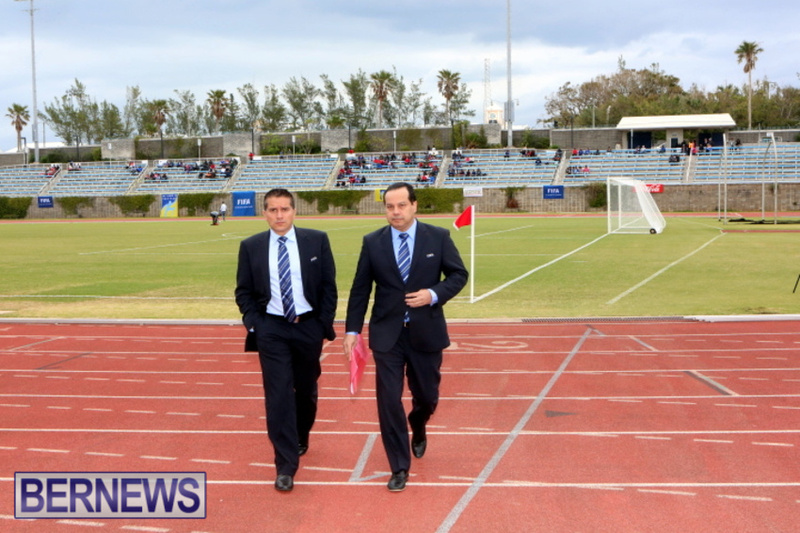 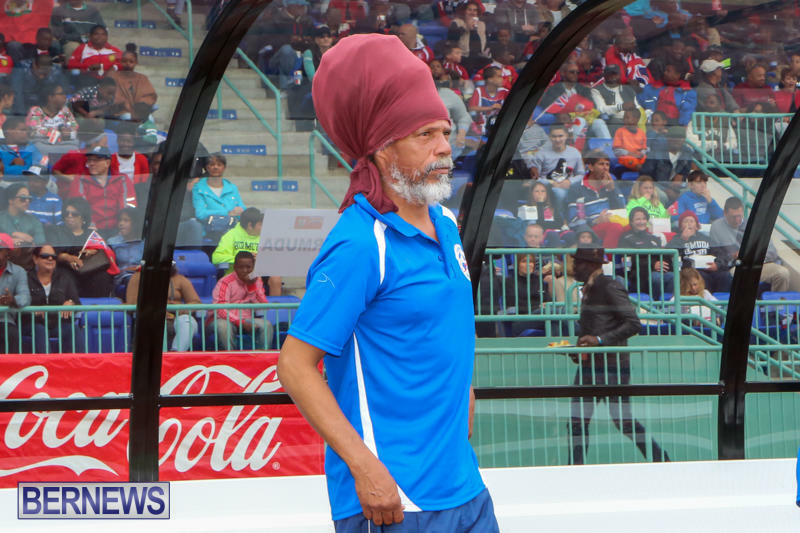 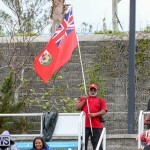 Before the match, Bermuda coach Andrew Bascome said, “It’s important that we use this game as preparation for Guatemala, because Guatemala is going to be tough. 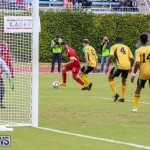 “I know our players have enough character to make sure we don’t lose by six goals, so that’s not really my concern – my concern is to make sure we cover all the basic principles, both in defense and offense. 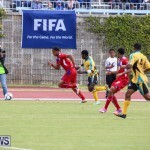 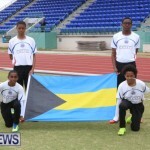 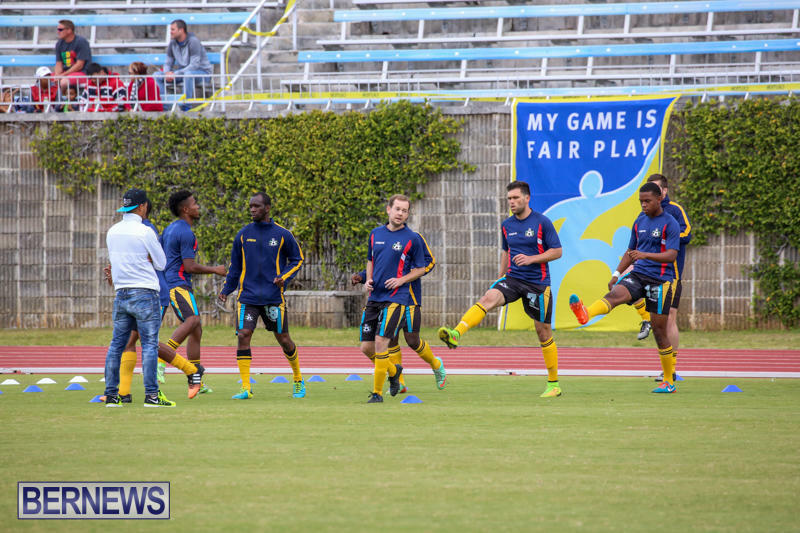 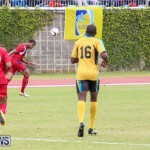 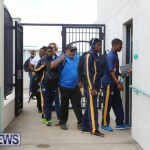 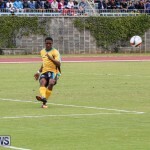 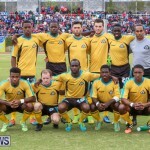 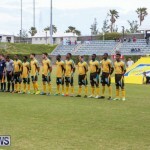 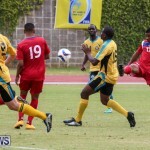 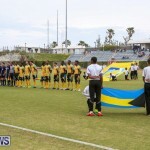 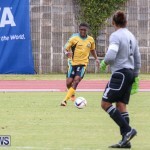 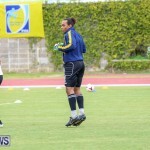 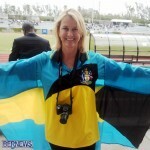 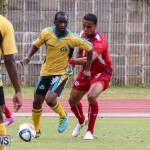 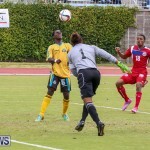 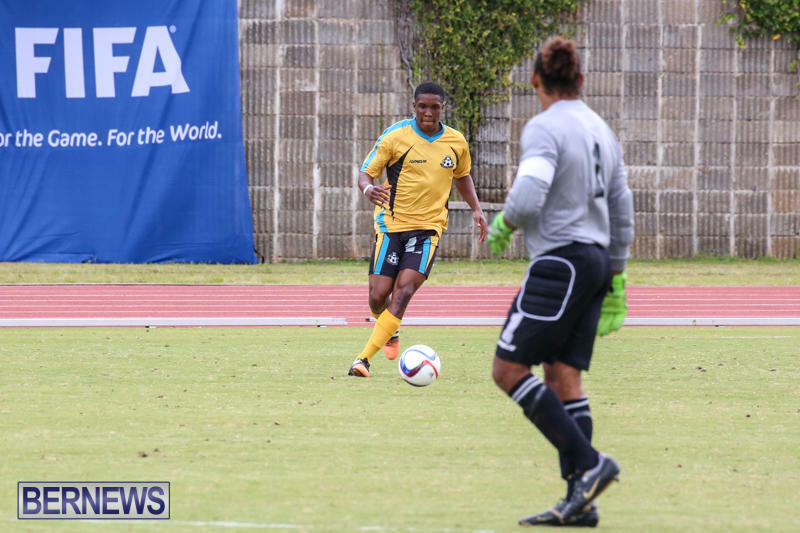 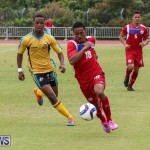 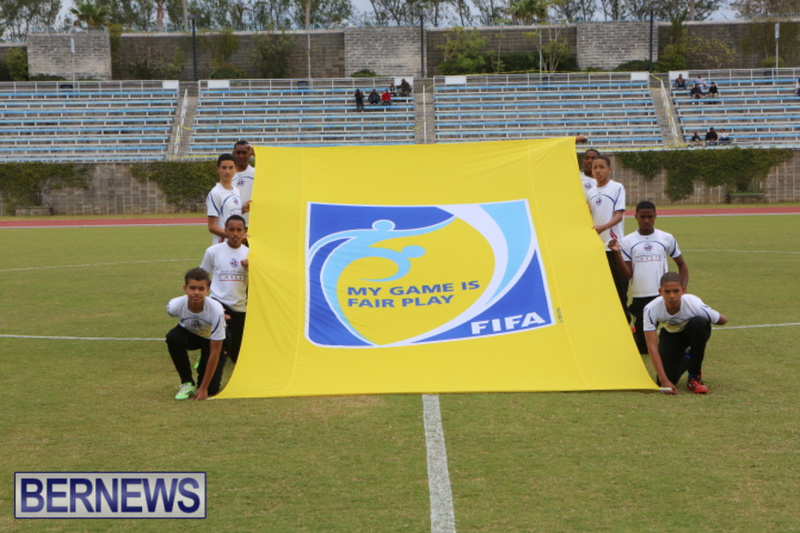 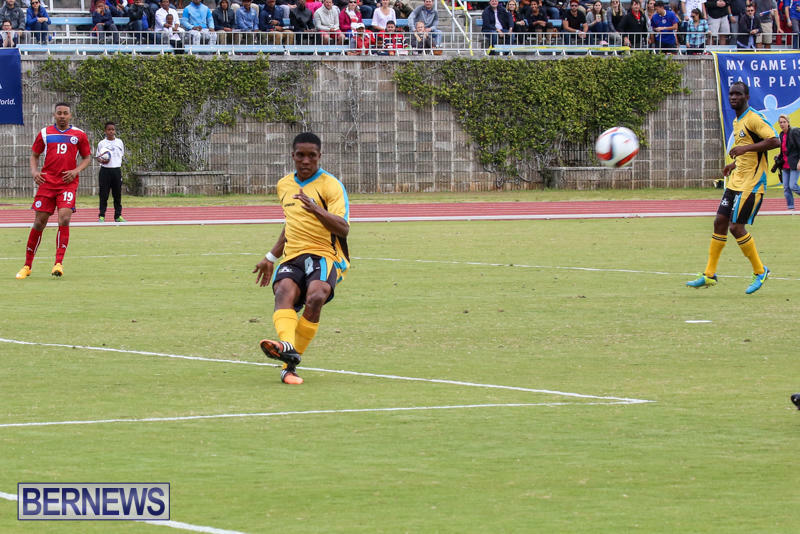 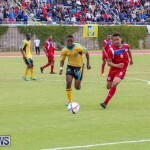 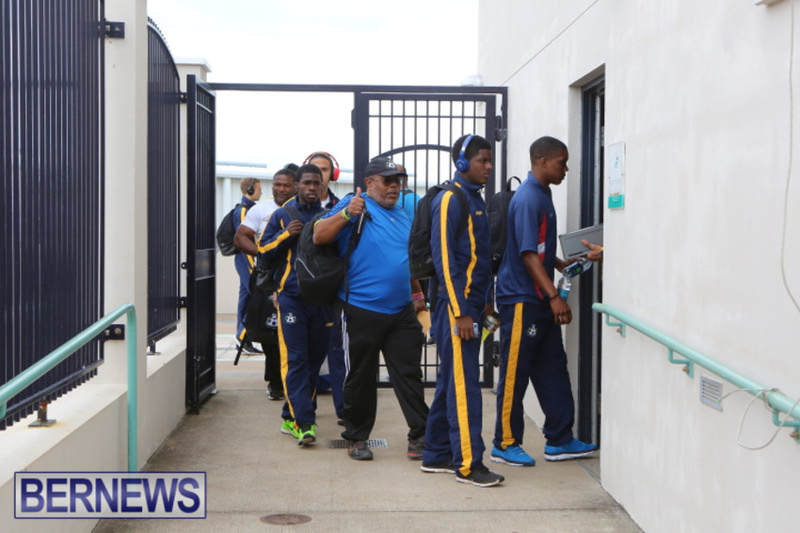 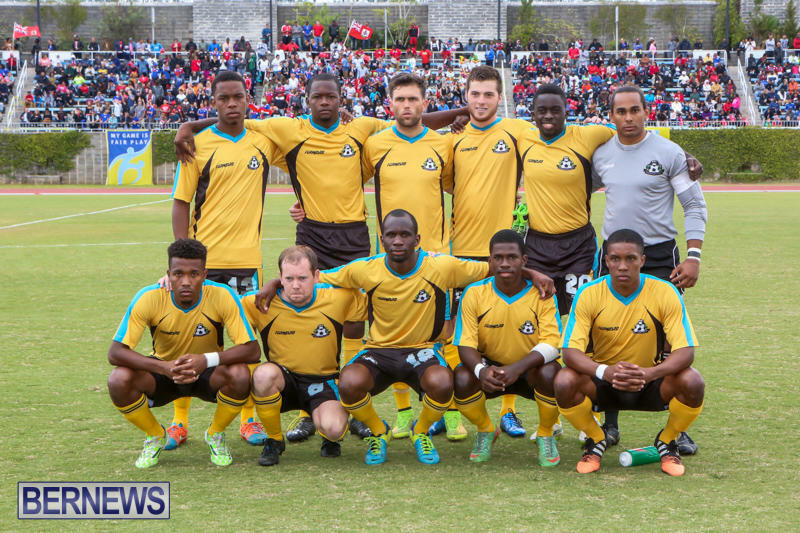 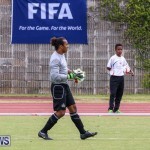 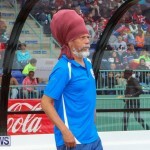 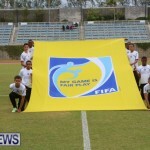 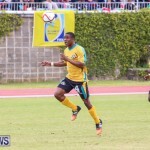 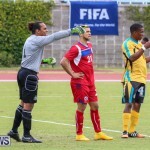 Bahamas coach Dion Godet said, “For us, it’s a must win. 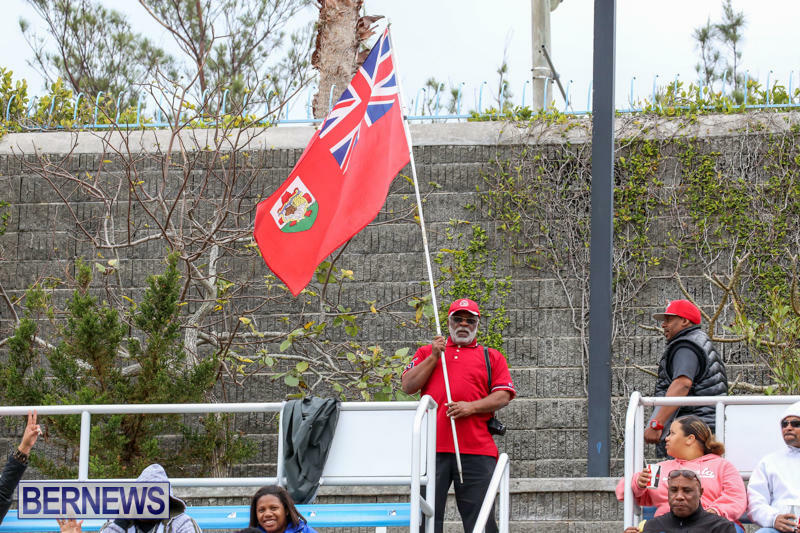 I understand that Bermuda probably can sit back a little bit, but we’ve got to find a way to win – we’ve got to produce a result. 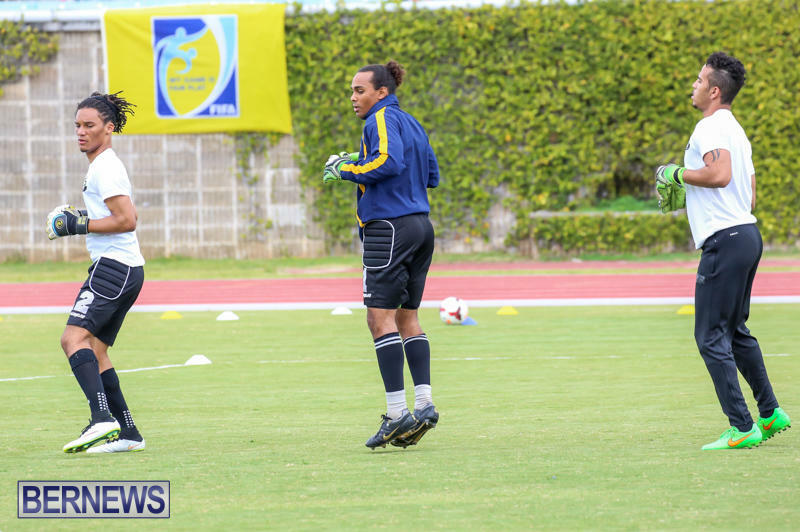 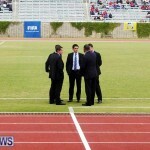 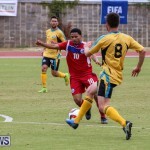 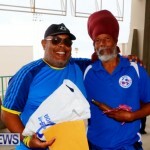 “As a result, our captain, Lesly St. Fleur, is in El Salvador, and so is Nesley Jean, one of our more experienced footballers – he’s in El Salvador with that squad. 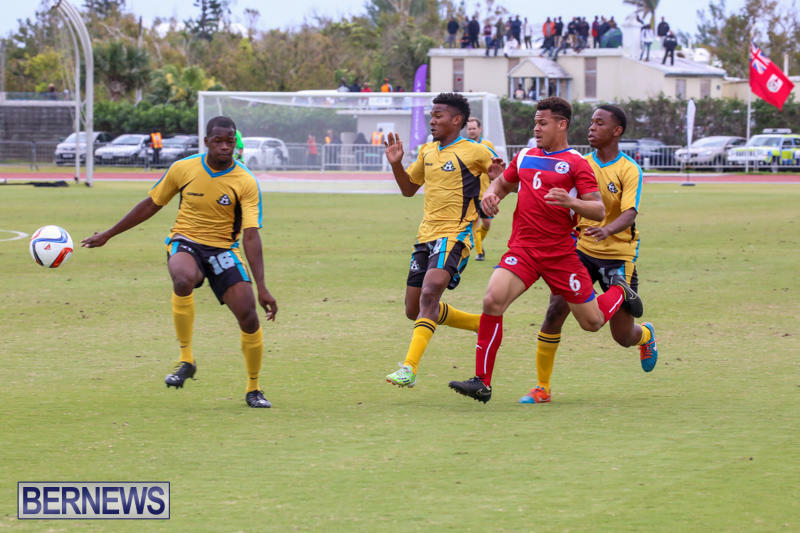 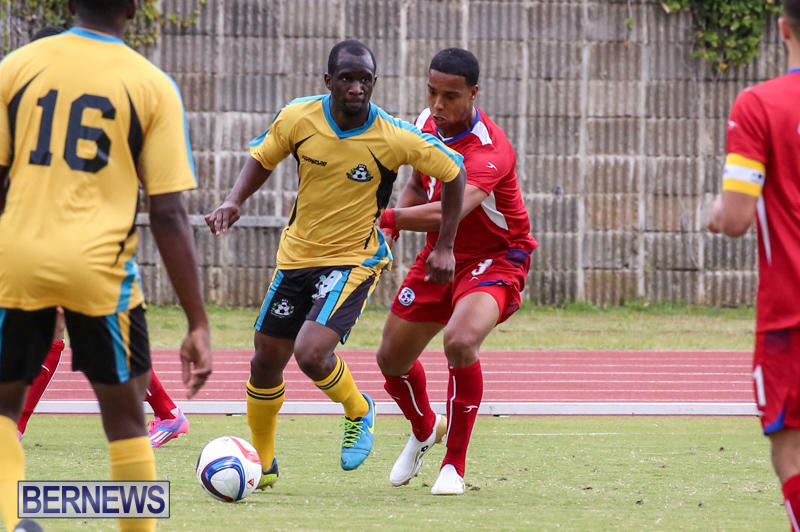 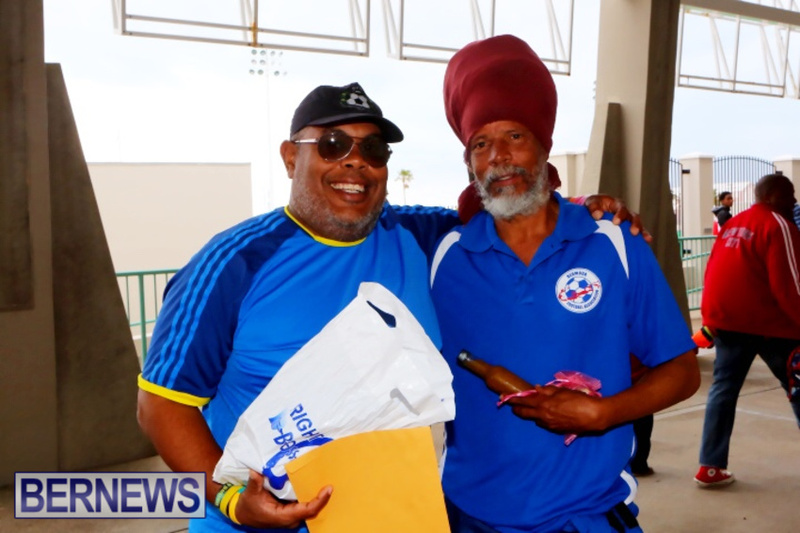 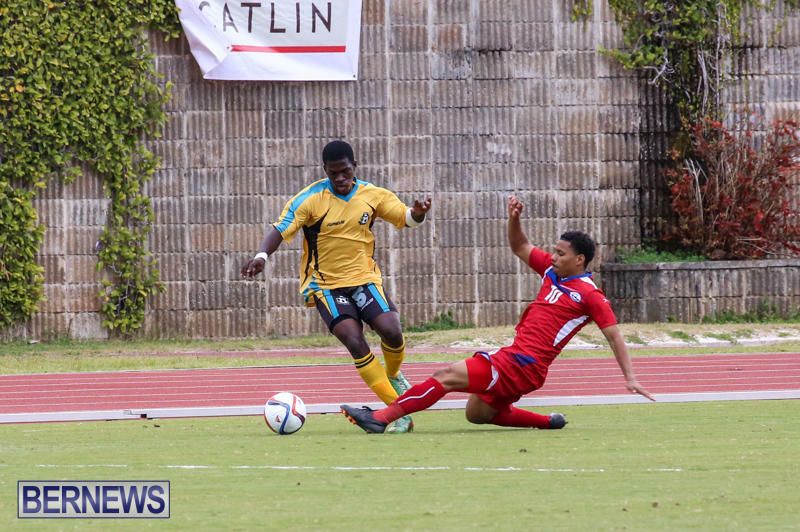 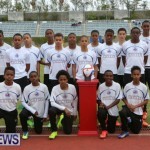 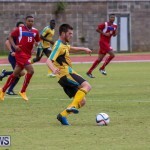 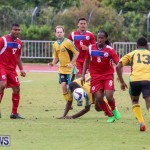 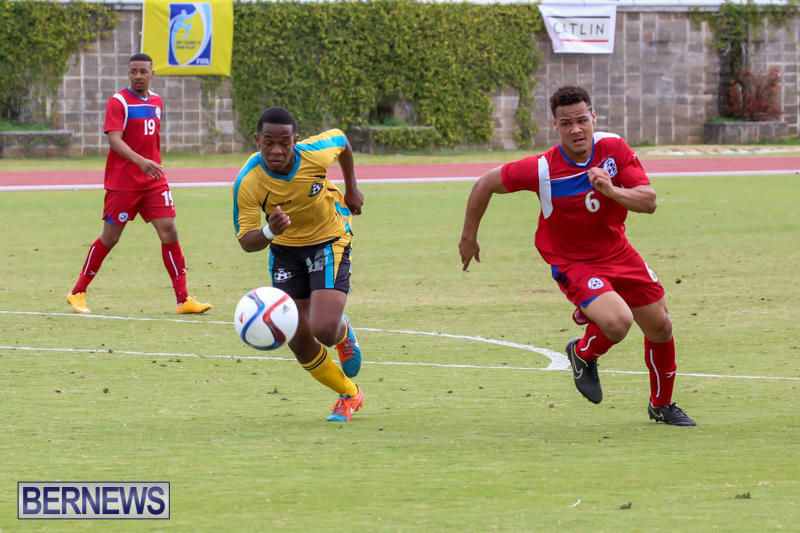 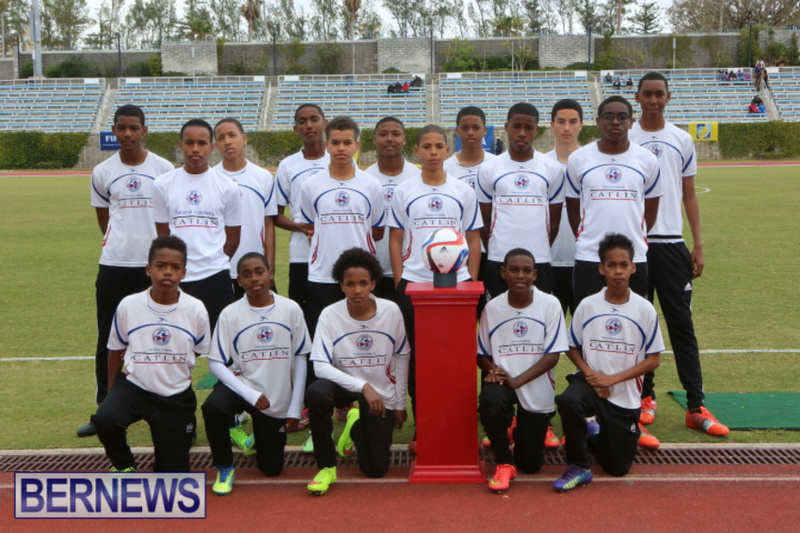 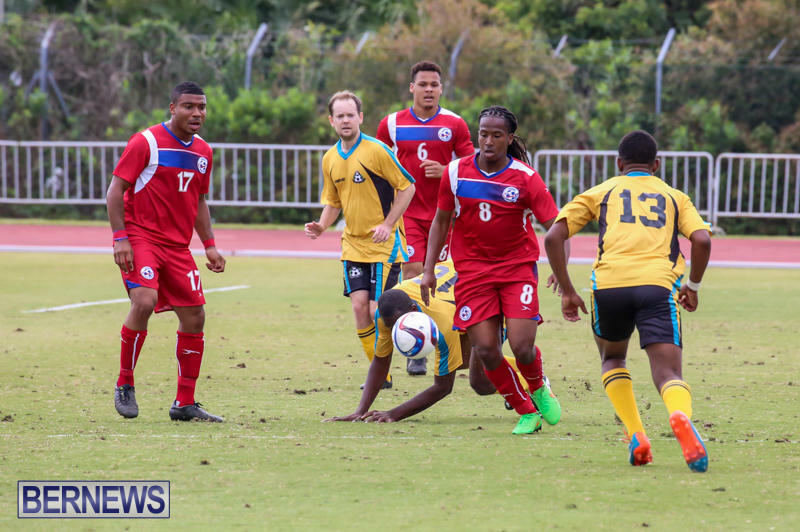 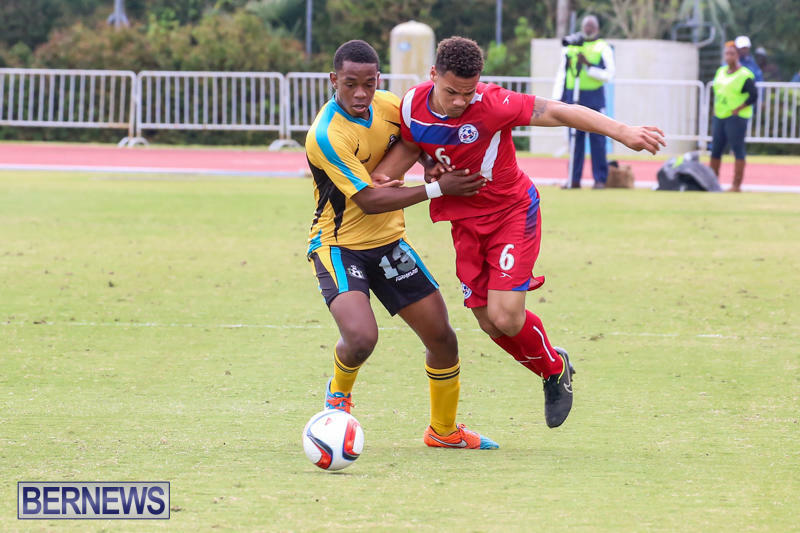 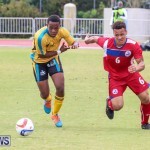 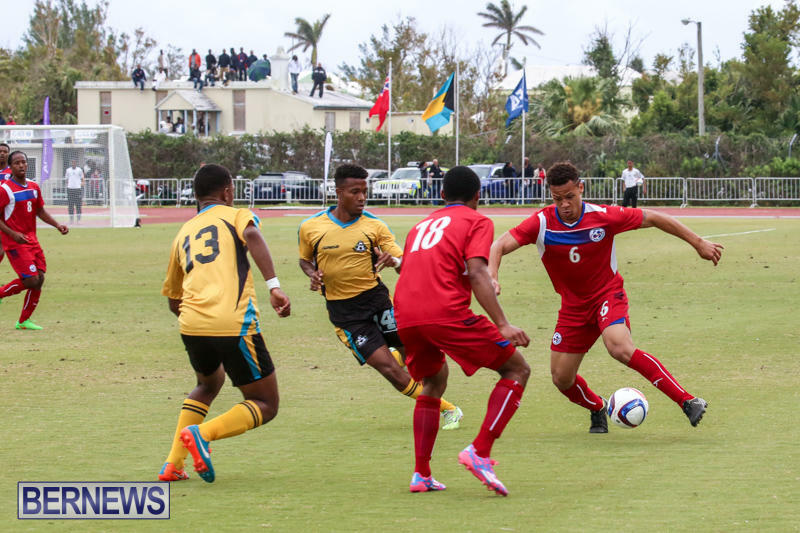 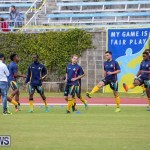 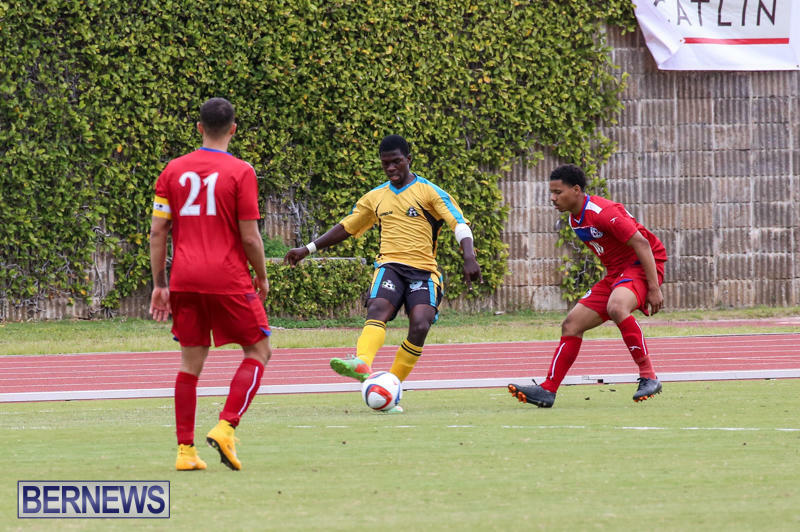 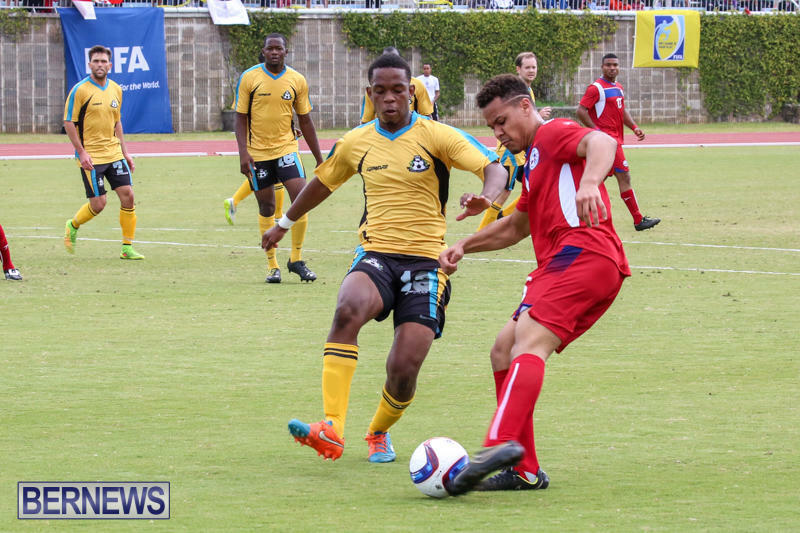 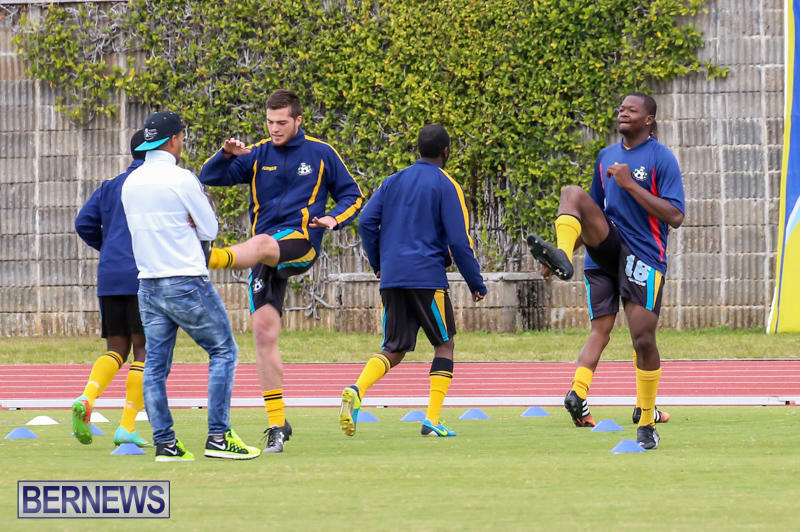 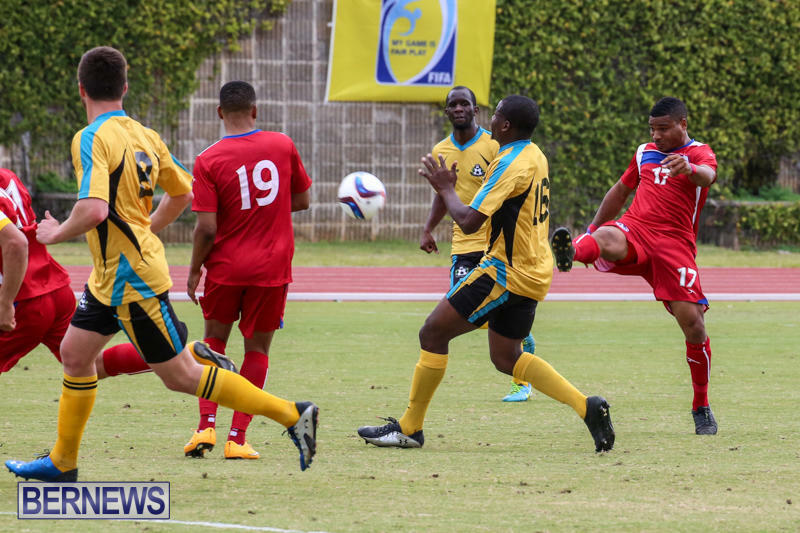 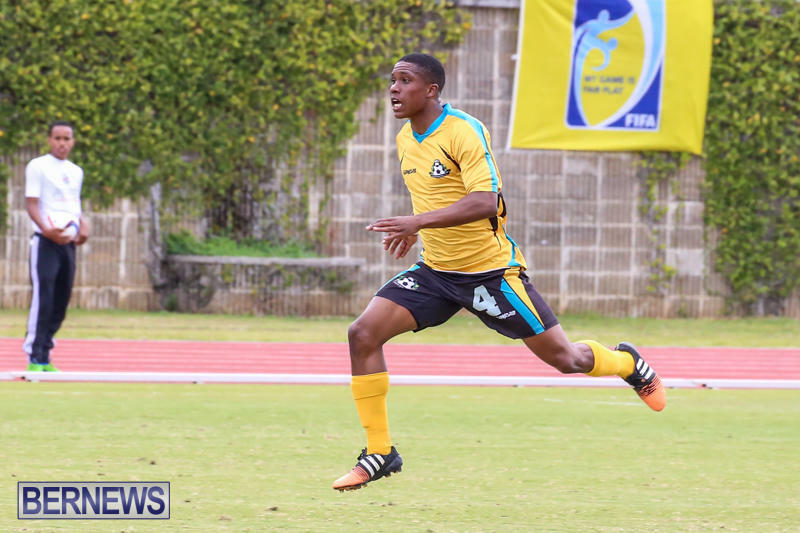 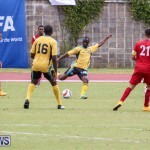 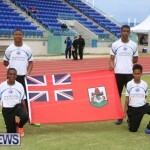 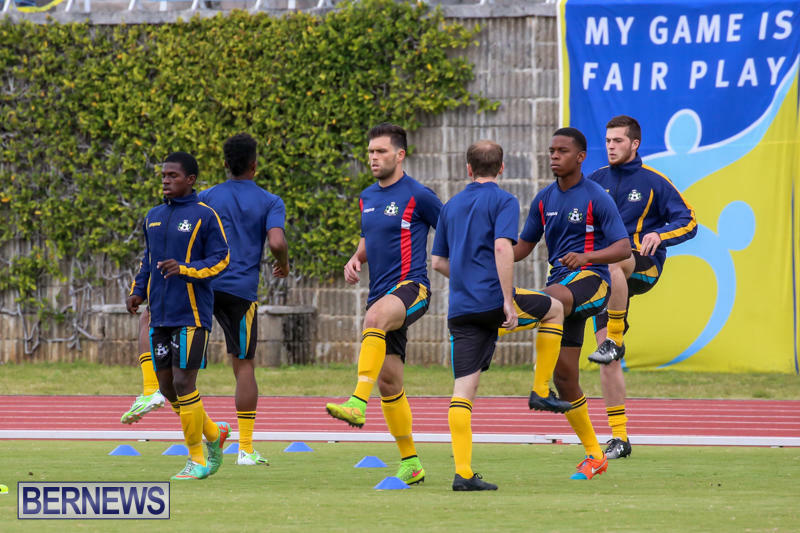 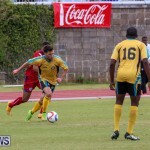 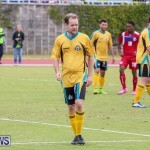 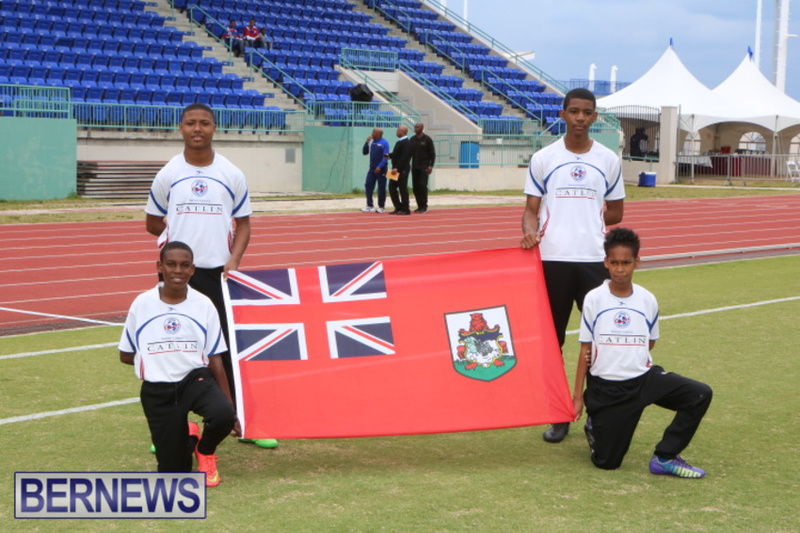 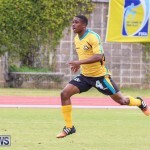 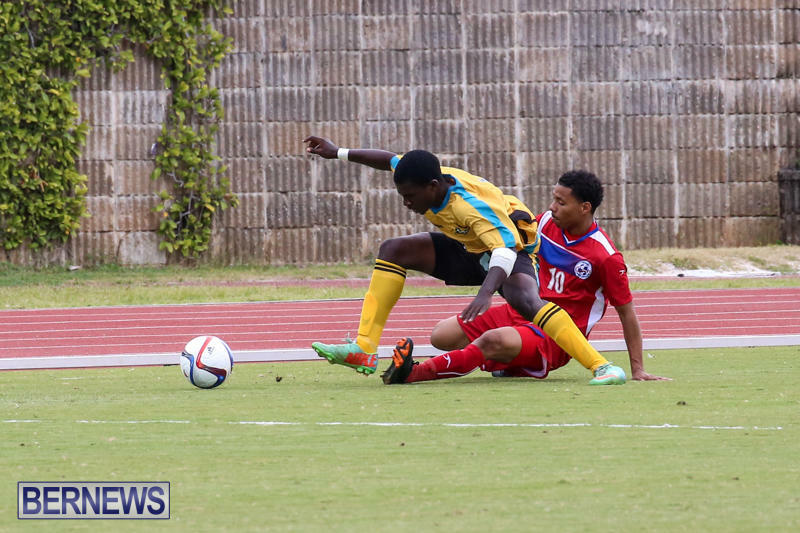 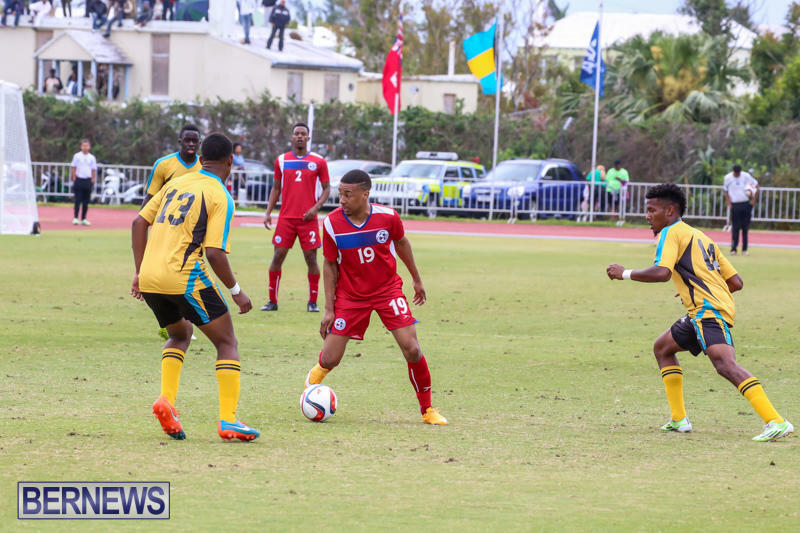 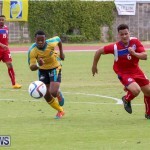 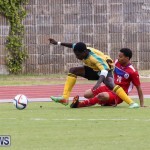 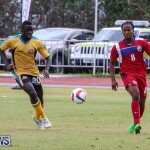 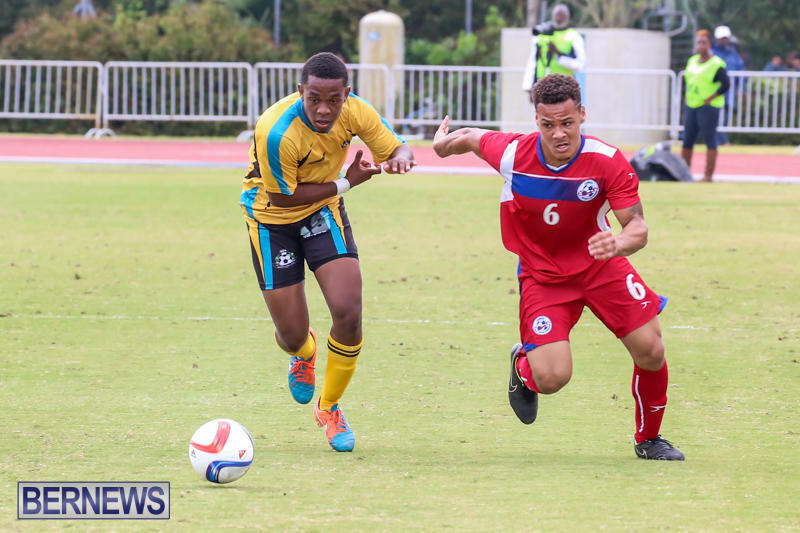 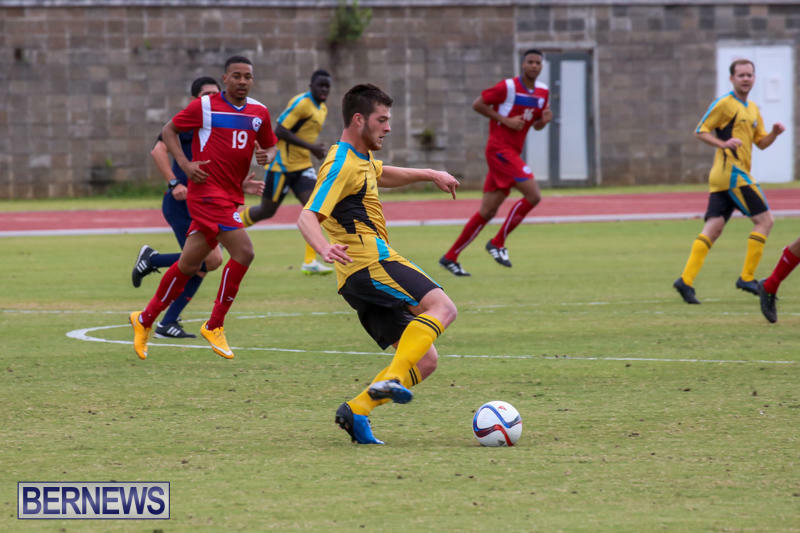 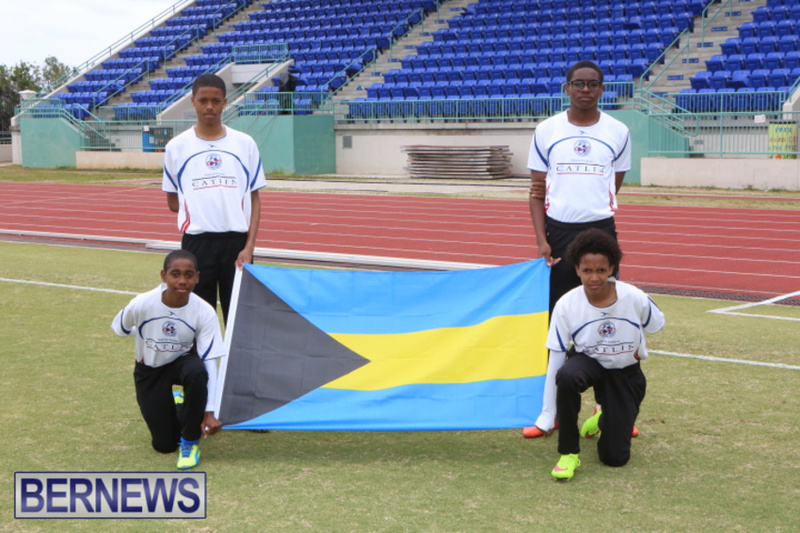 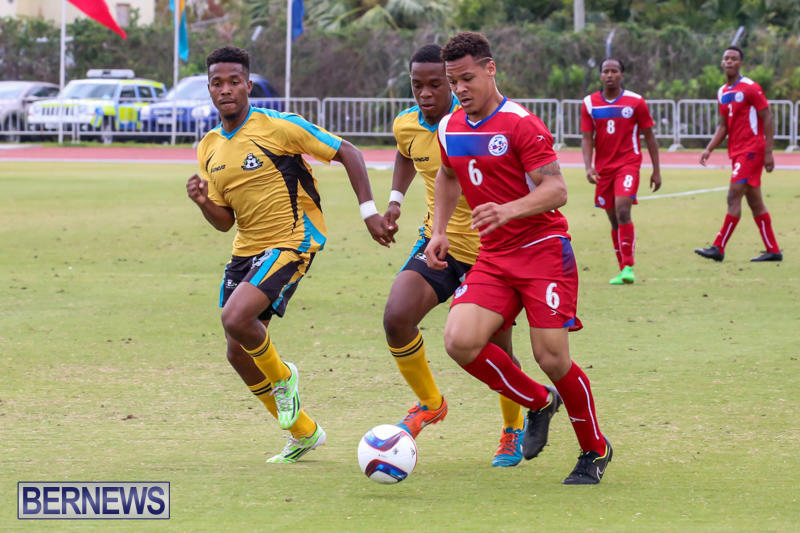 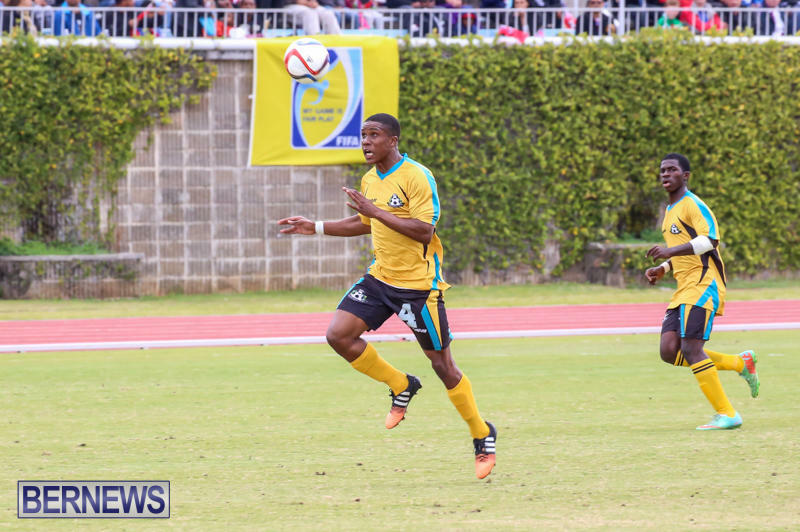 And we lost Cameron Hepple – he actually has a broken ankle from the match back in the Bahamas on Wednesday,” added Coach Godet. 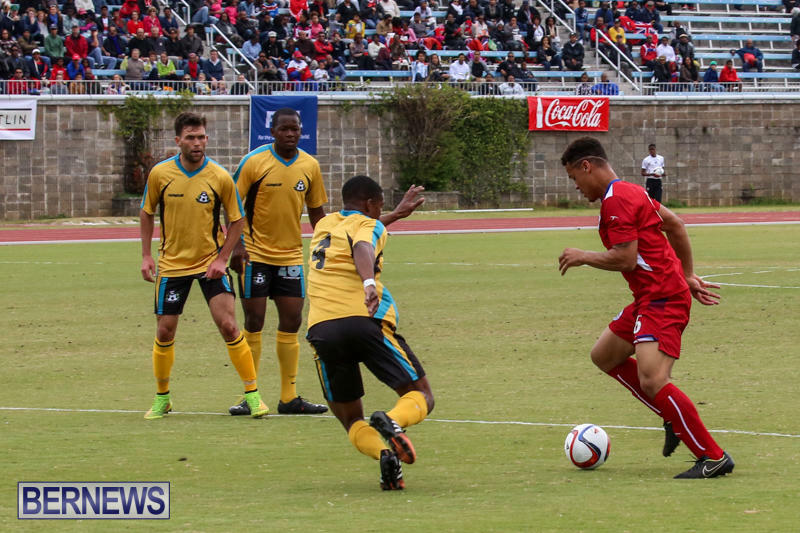 As of half-time the game is 0-0, with Bermuda having missed a chance to score when Nahki Wells penalty came off the crossbar. 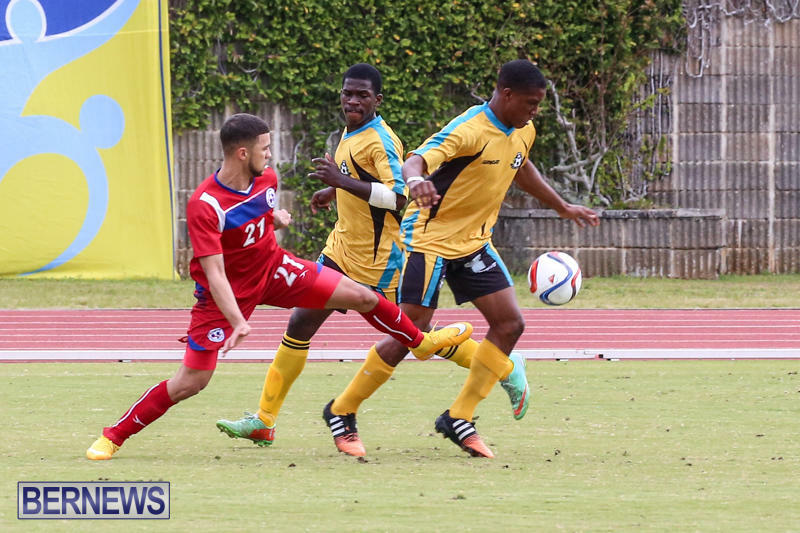 We will have additional photos after the game concludes, and for live updates on the match, click here to follow our live blog. 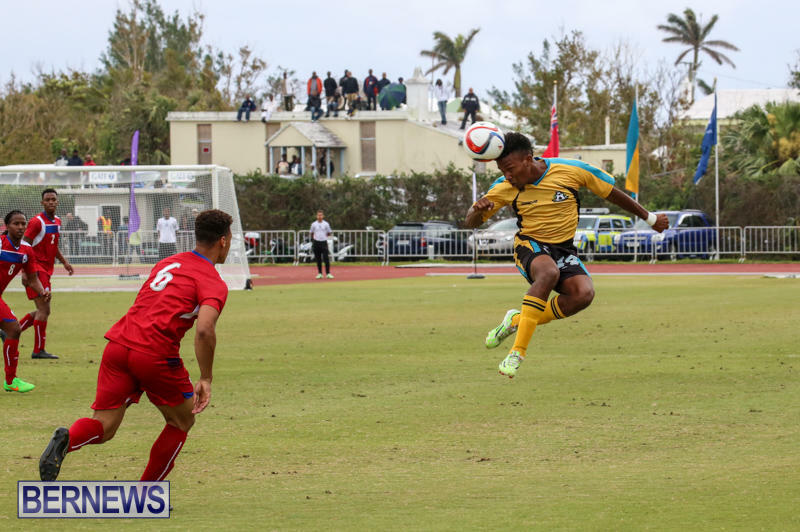 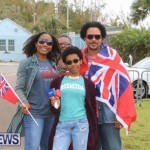 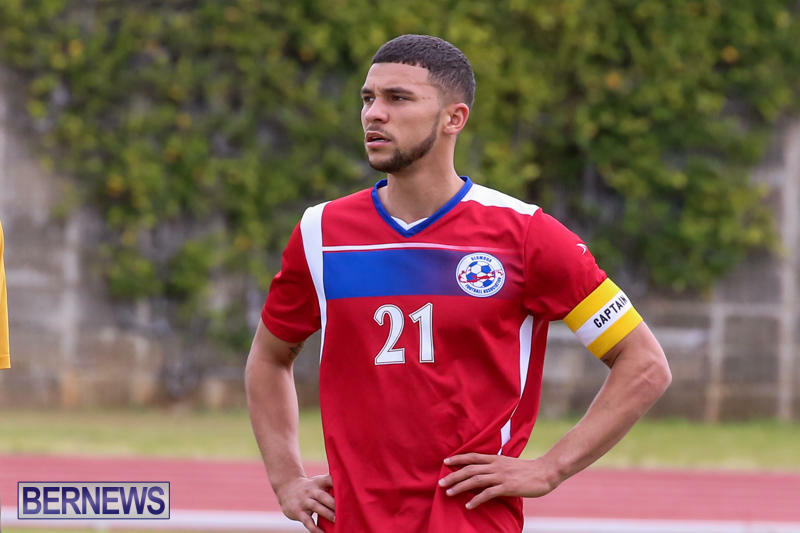 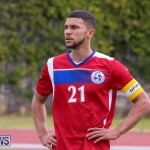 Update 5.08pm: Bermuda win 3-0, after three late goals which came in a flurry starting in the 79th minute, with Nahki Wells scoring two, and Tyrell Burgess scoring one. 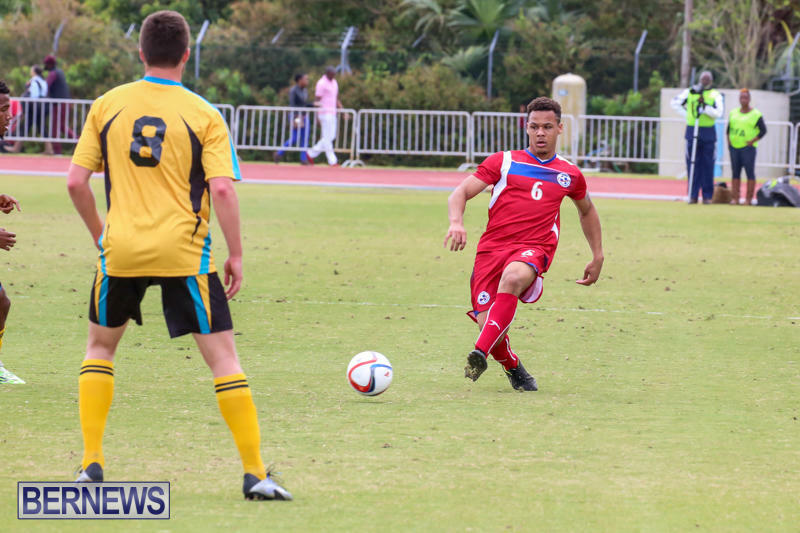 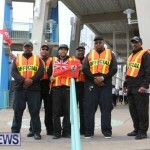 Bermuda will now advance to the next round.